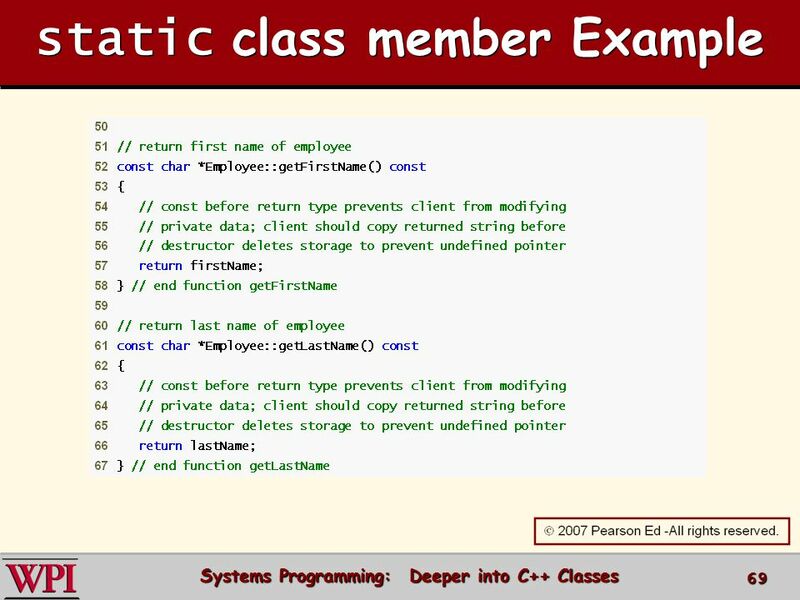 Classes: A Deeper Look Systems Programming. 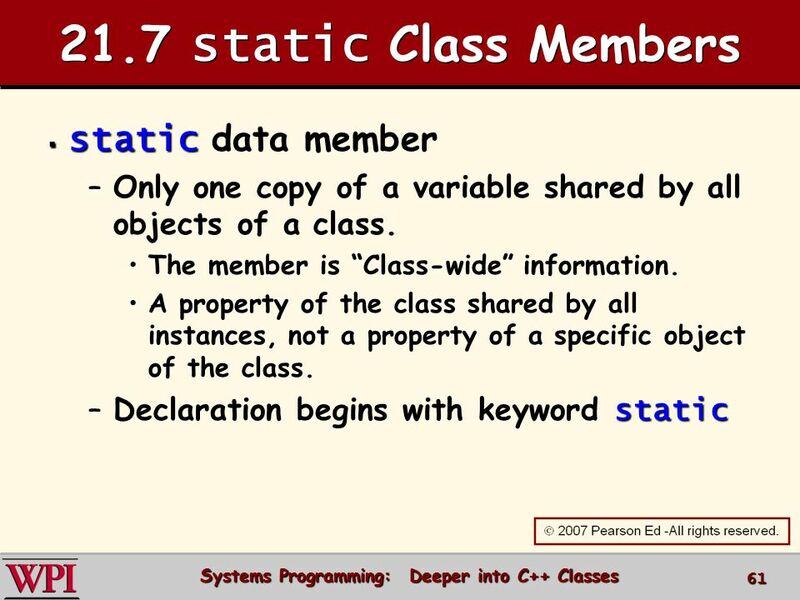 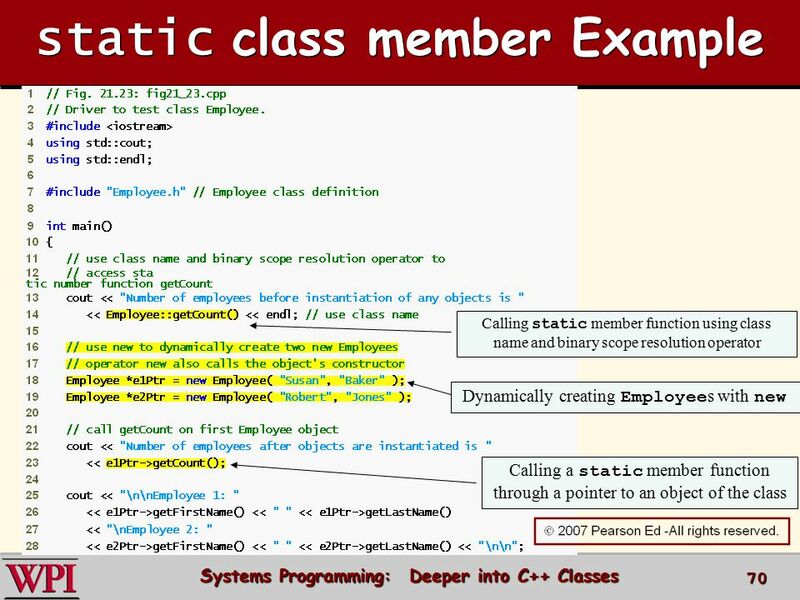 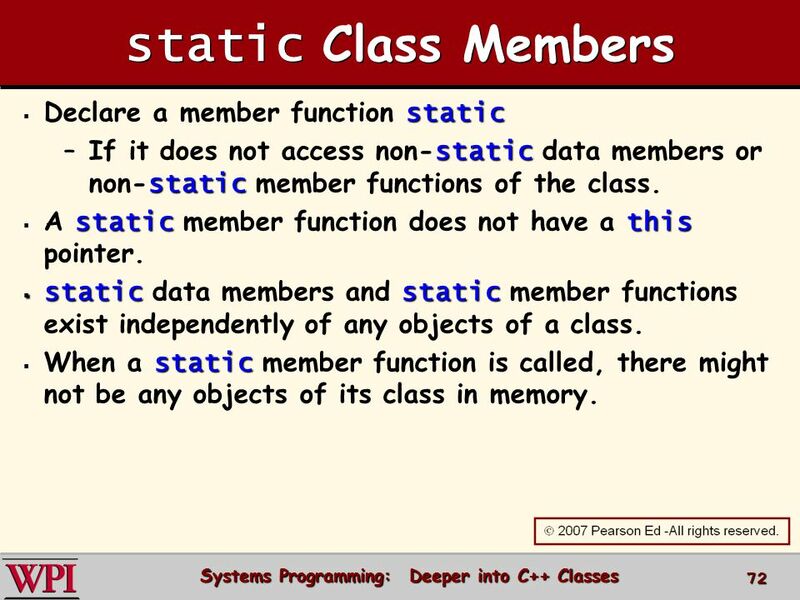 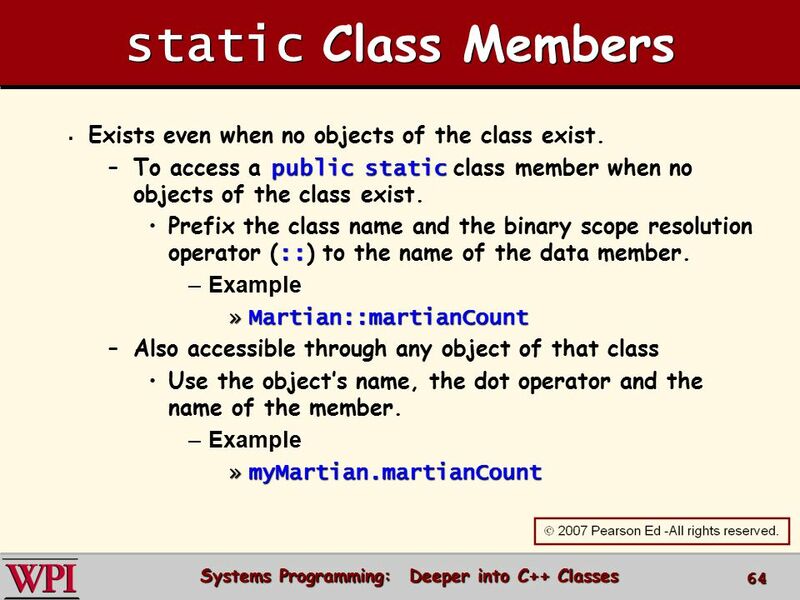 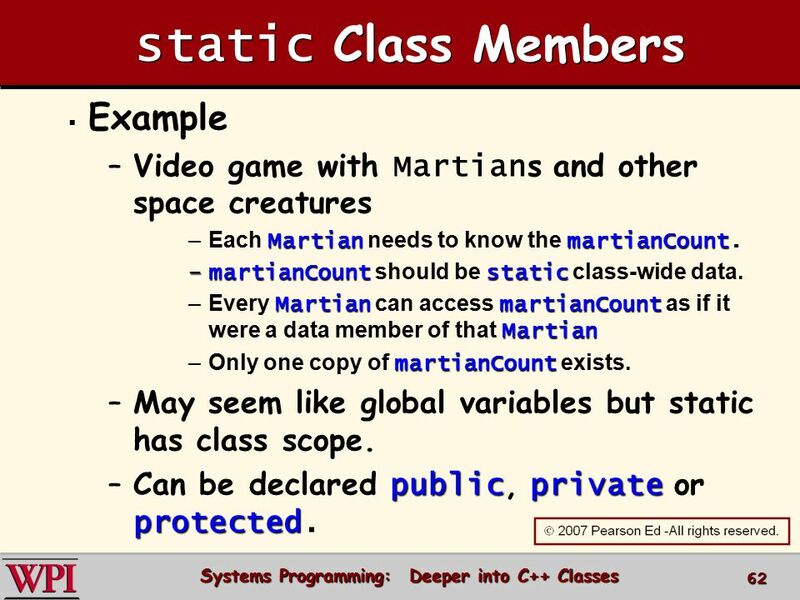 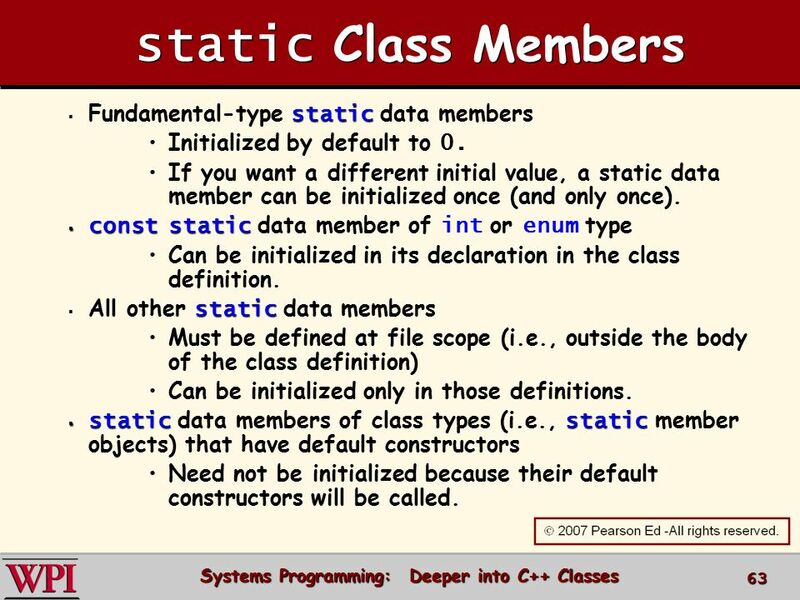 64 static Class Members Exists even when no objects of the class exist. 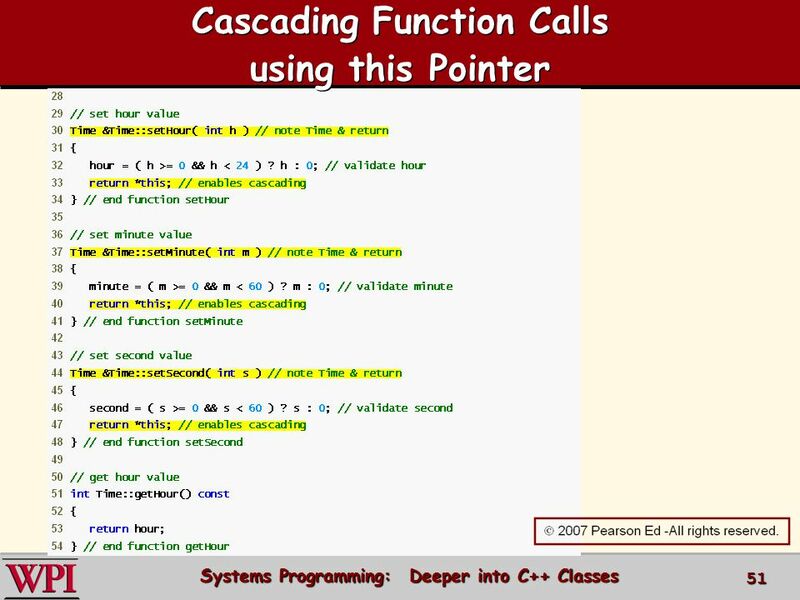 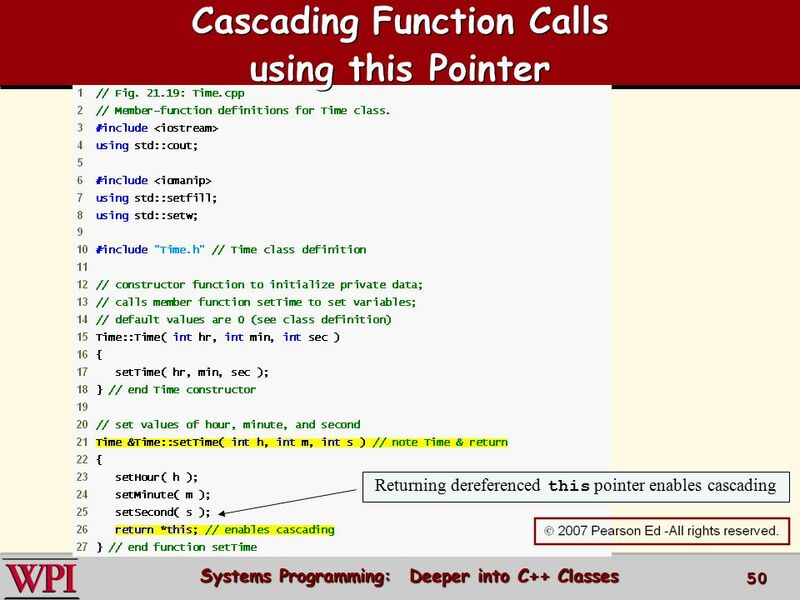 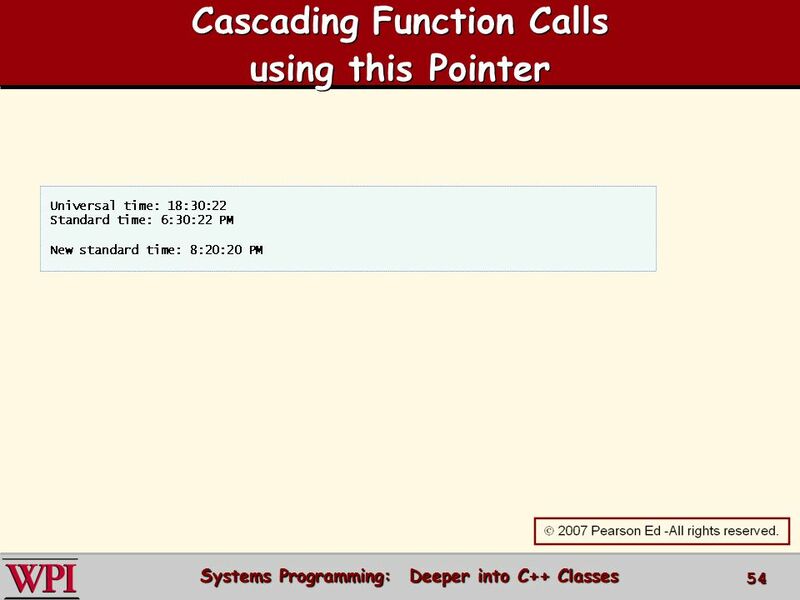 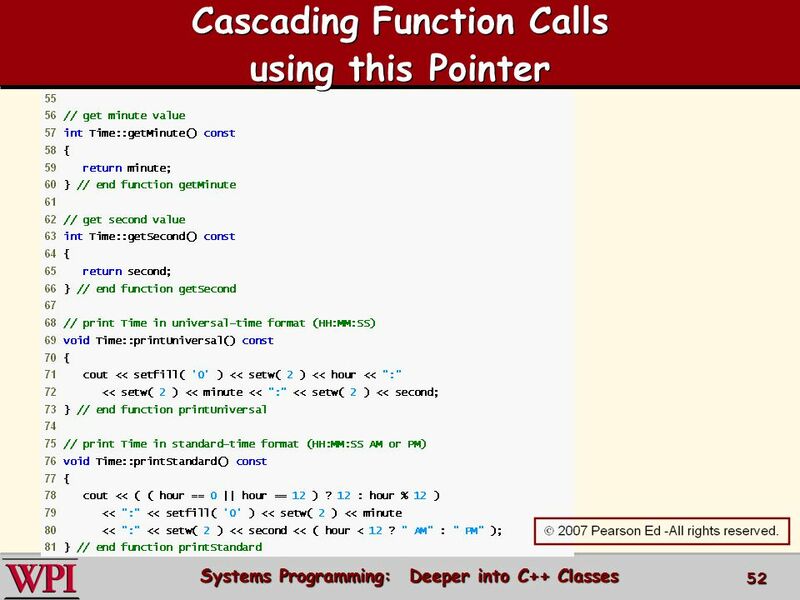 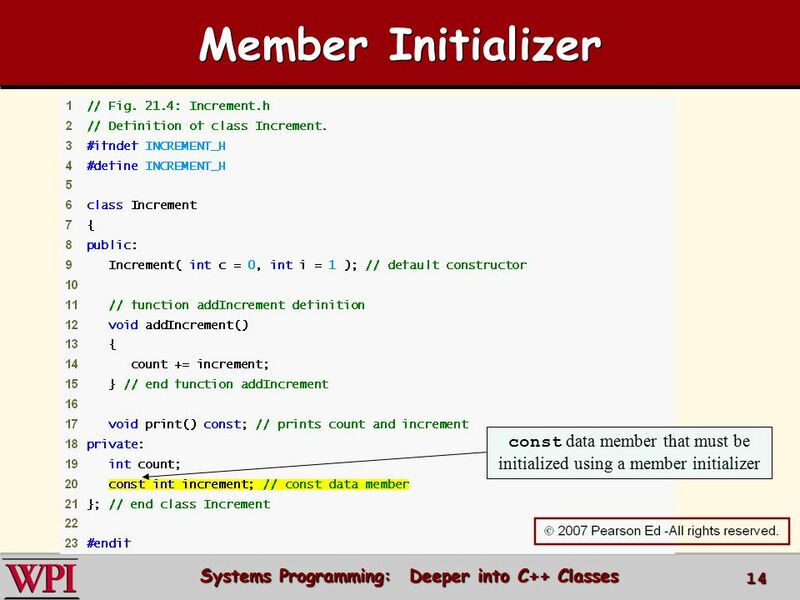 Download ppt "Classes: A Deeper Look Systems Programming." 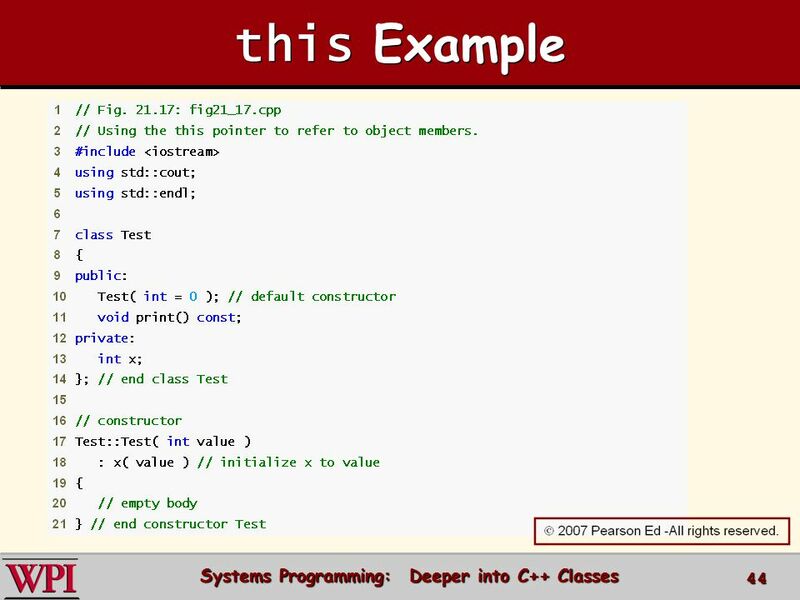 Java™ How to Program, 9/e Presented by: Dr. José M. Reyes Álamo © Copyright by Pearson Education, Inc. All Rights Reserved. 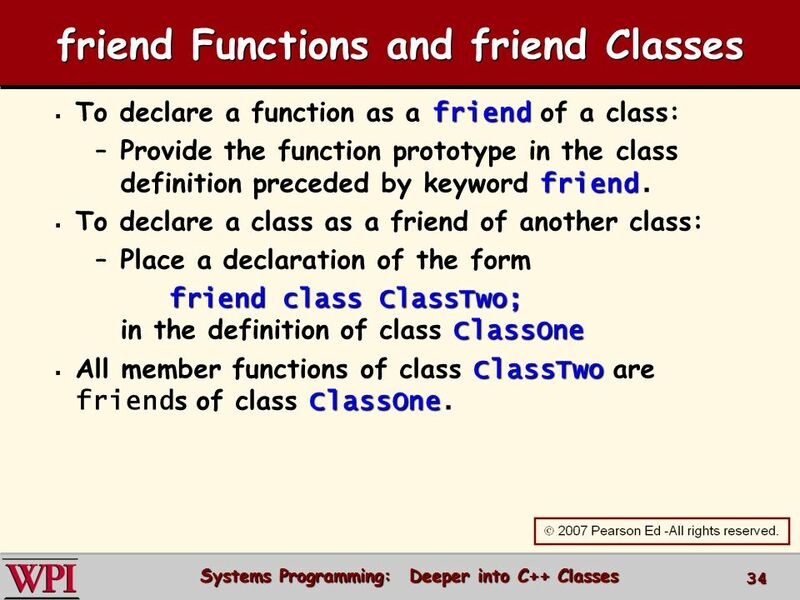  2008 Pearson Education, Inc. All rights reserved Classes: A Deeper Look, Part 2. 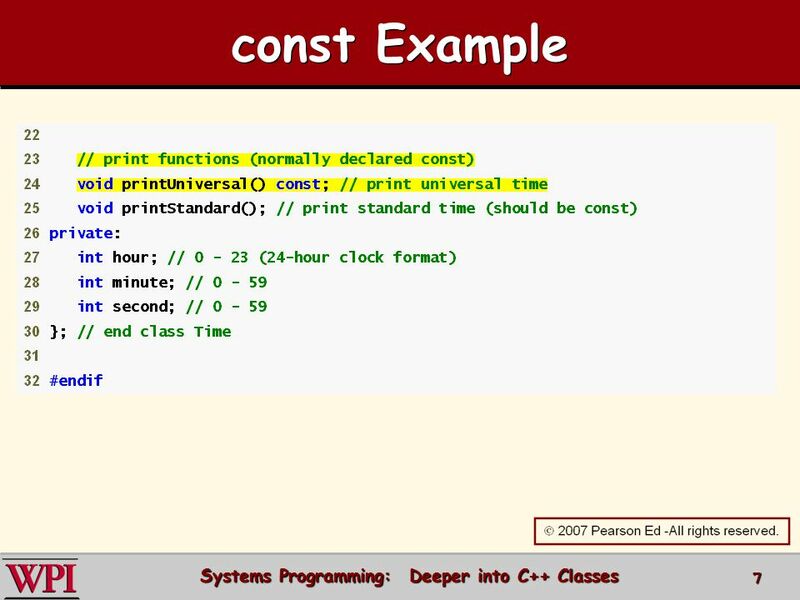 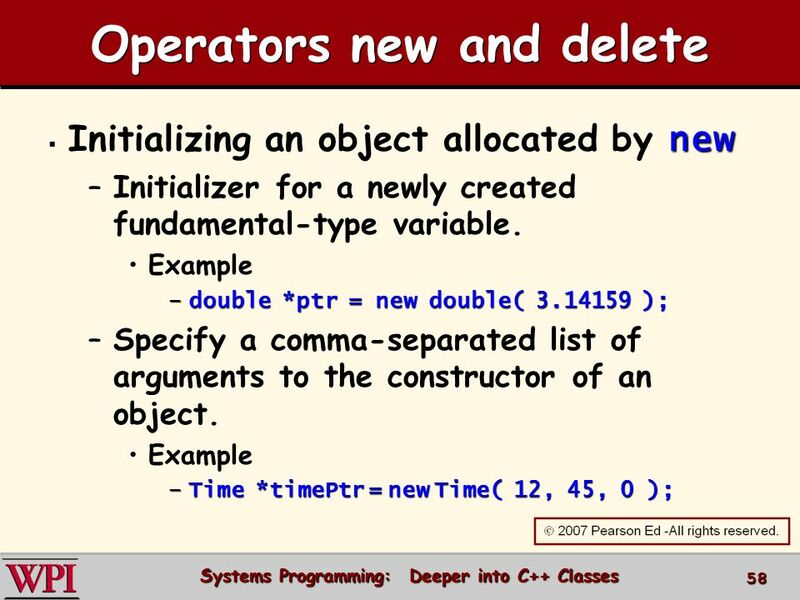 C++ How to Program, 7/e © by Pearson Education, Inc. All Rights Reserved. 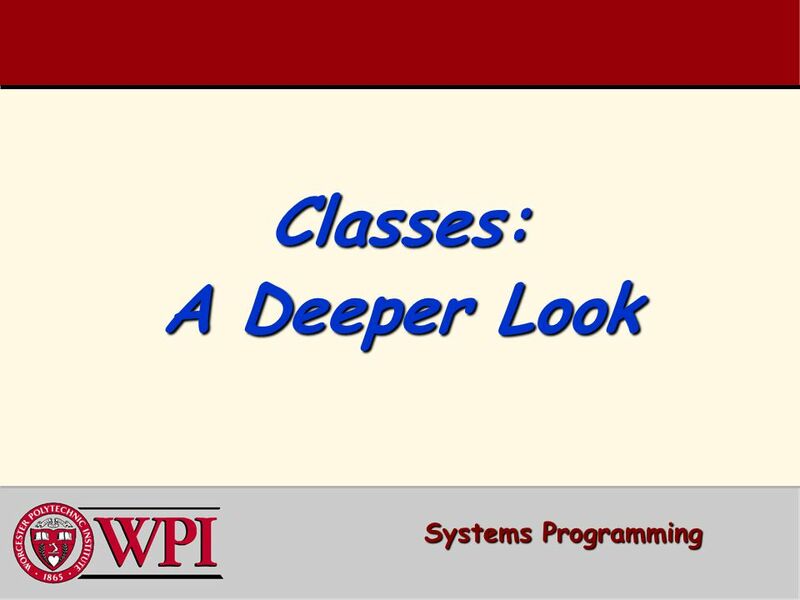 Classes: A Deeper Look Systems Programming. 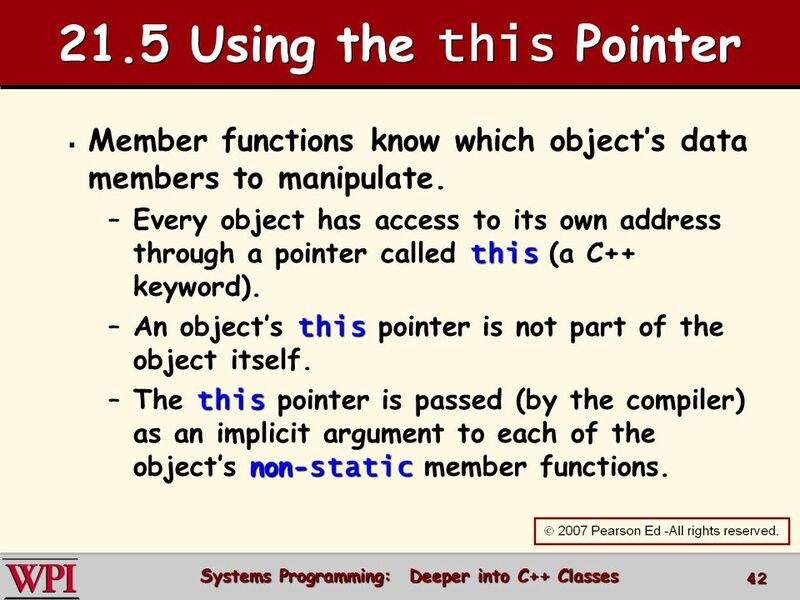 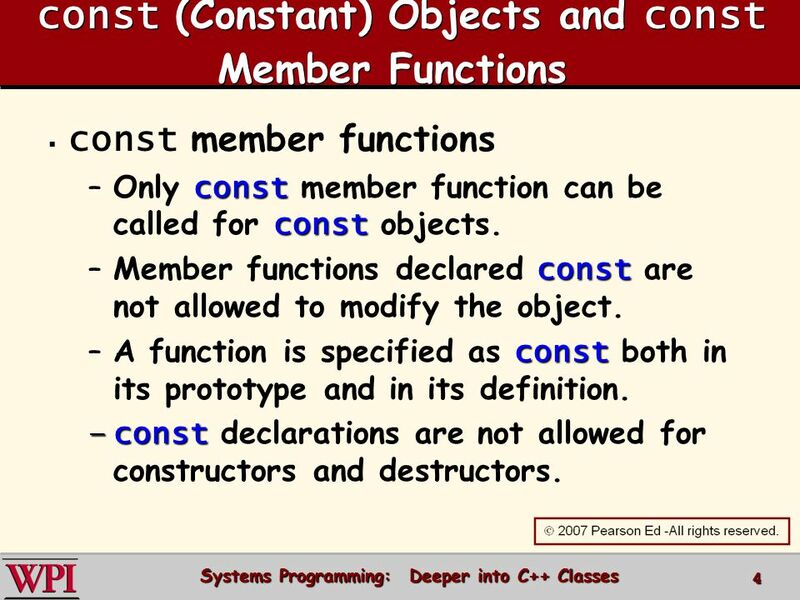  constconst  const objects and const member functions   Composition   Friendship  this  this pointer. 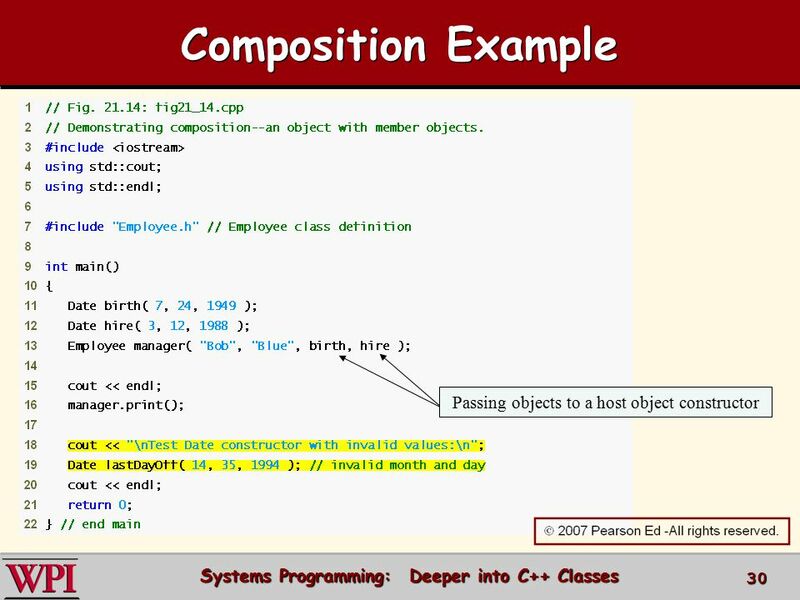 計算機程式語言 Lecture 10-1 國立台灣大學生物機電系 林達德 10 Classes: A Deeper Look, Part 2. 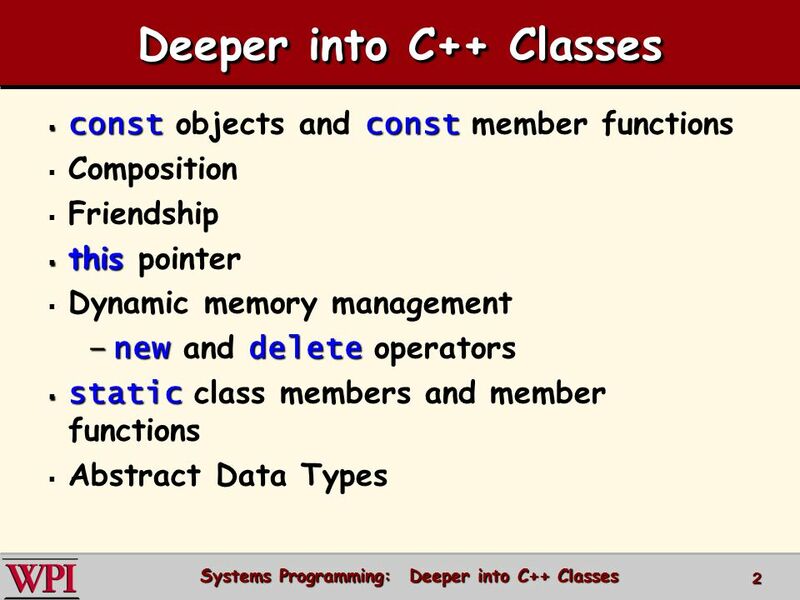 Chapter 14: Overloading and Templates C++ Programming: Program Design Including Data Structures, Fifth Edition. 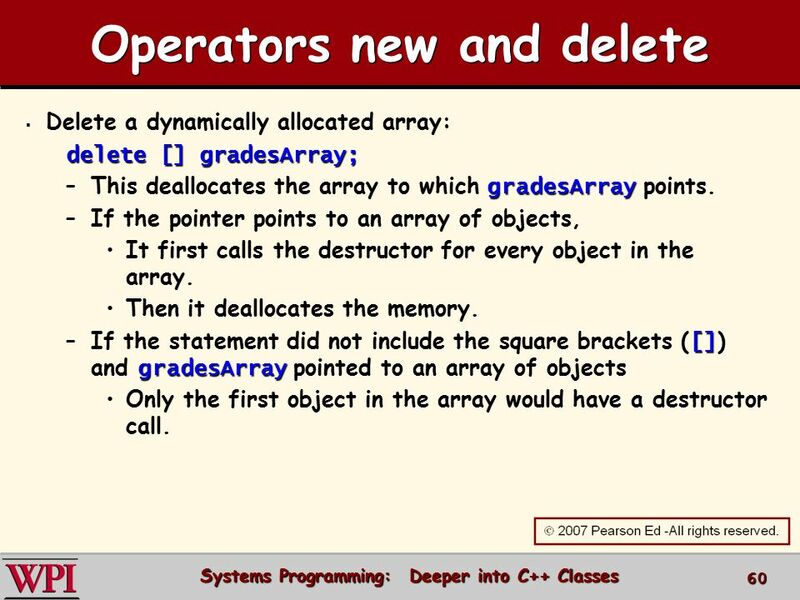  2006 Pearson Education, Inc. All rights reserved Operator Overloading. 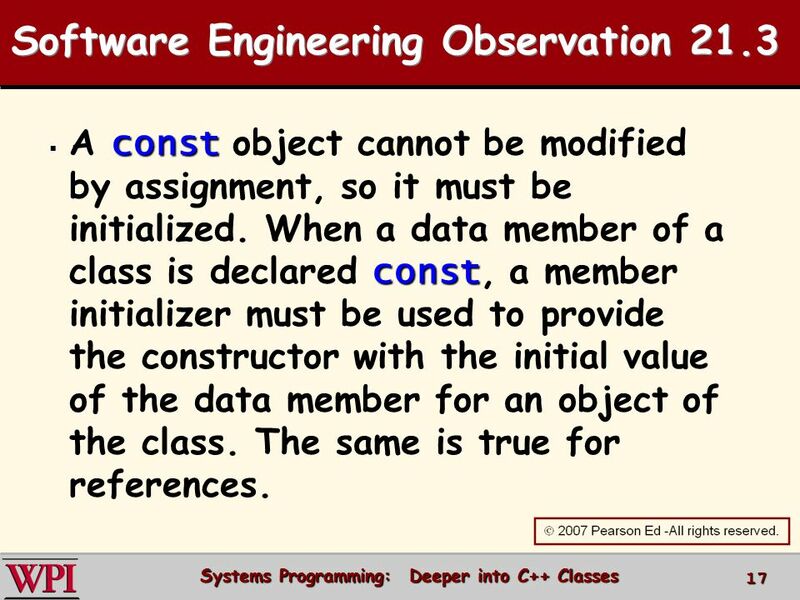  2006 Pearson Education, Inc. All rights reserved Introduction to Classes and Objects. 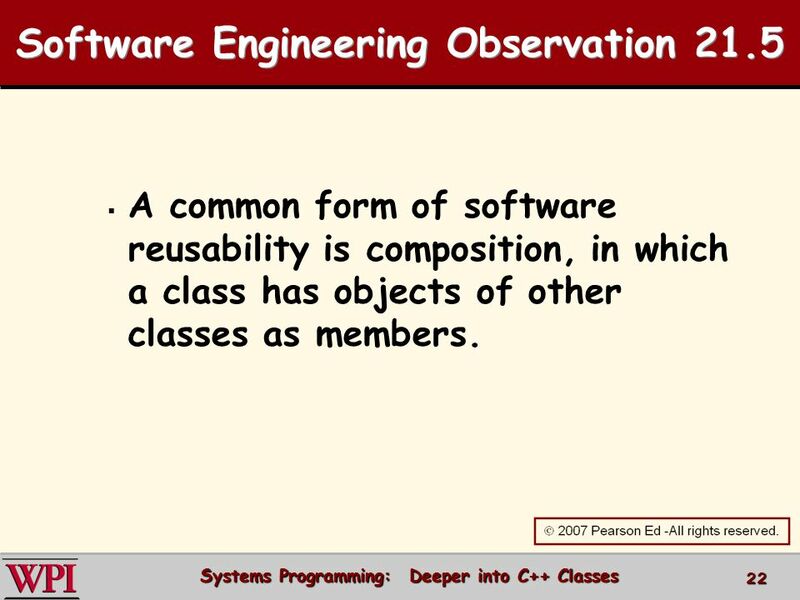  2006 Pearson Education, Inc. All rights reserved Midterm review Introduction to Classes and Objects. 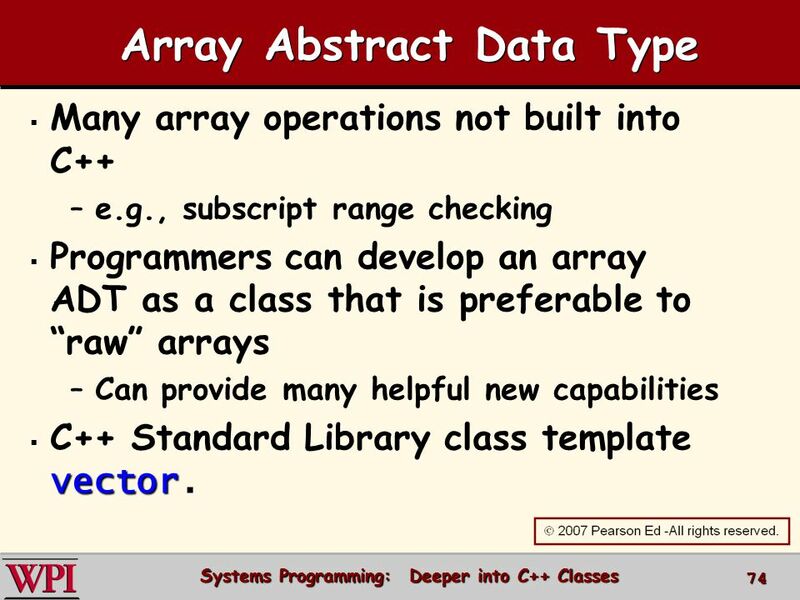  2006 Pearson Education, Inc. All rights reserved Arrays. 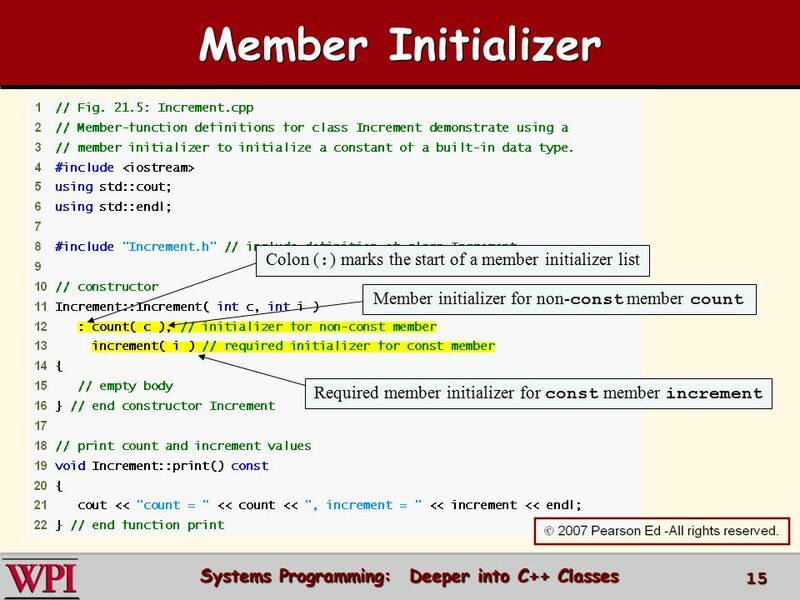 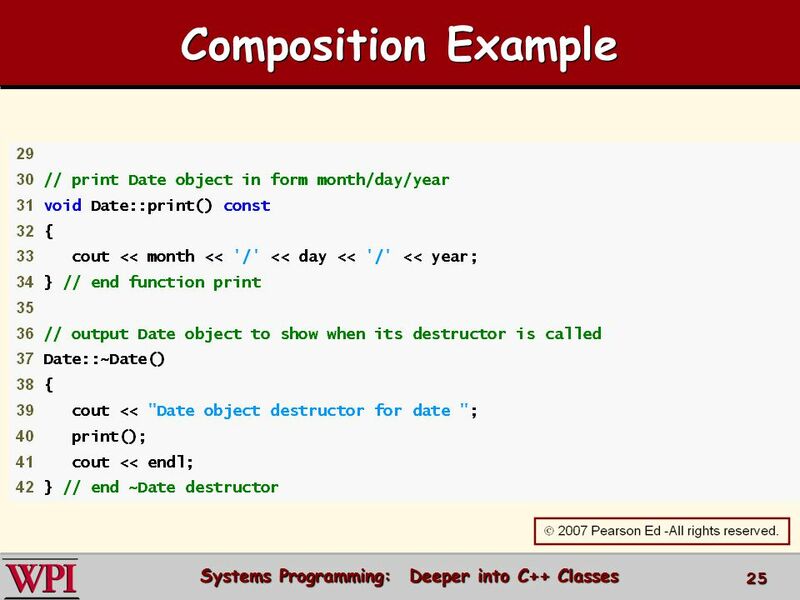 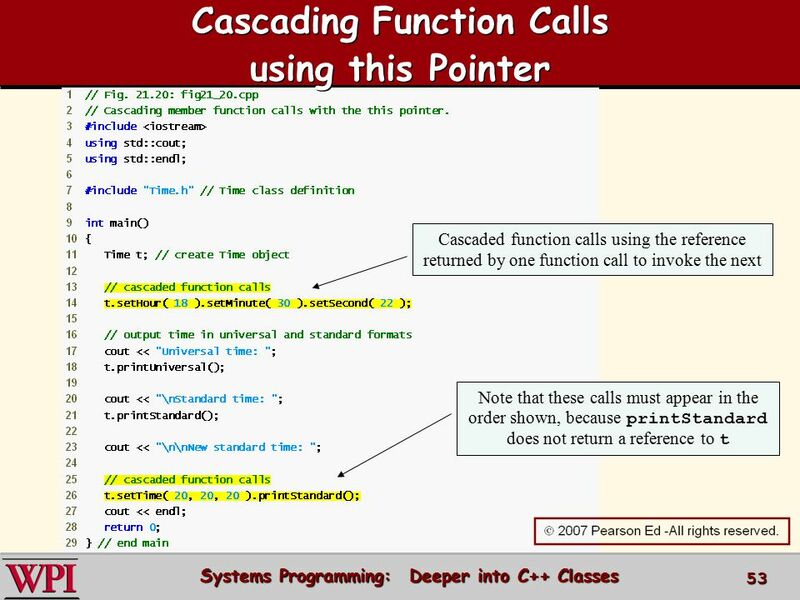 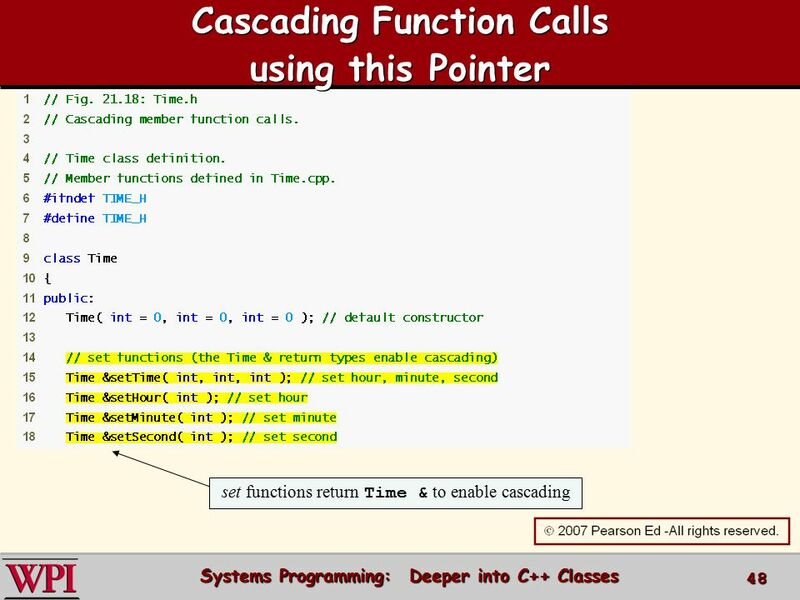 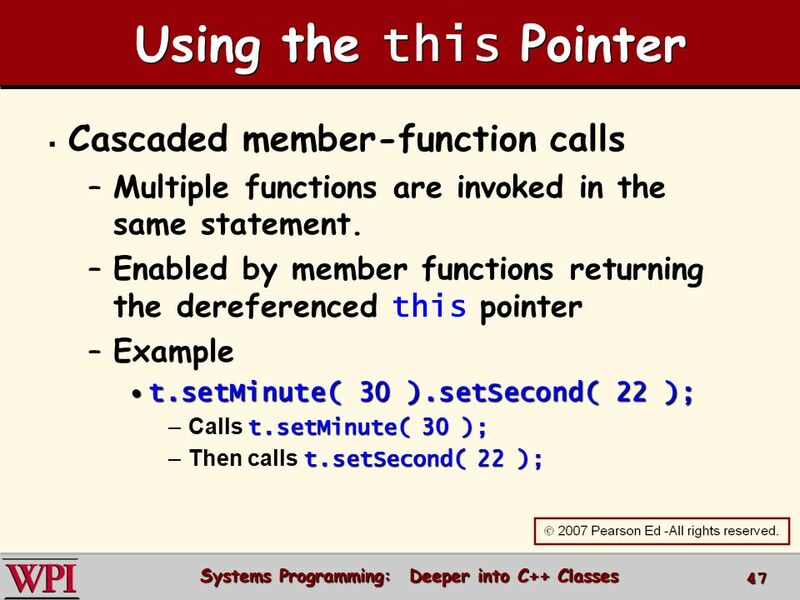 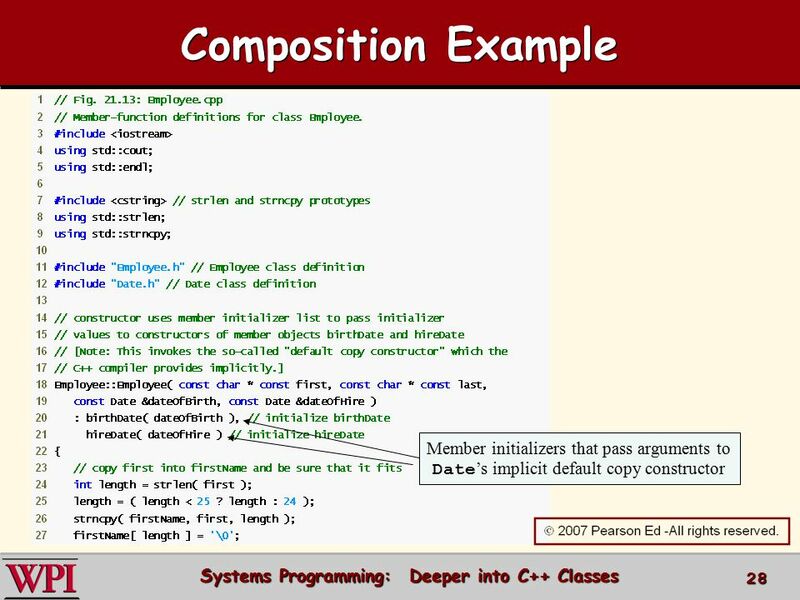 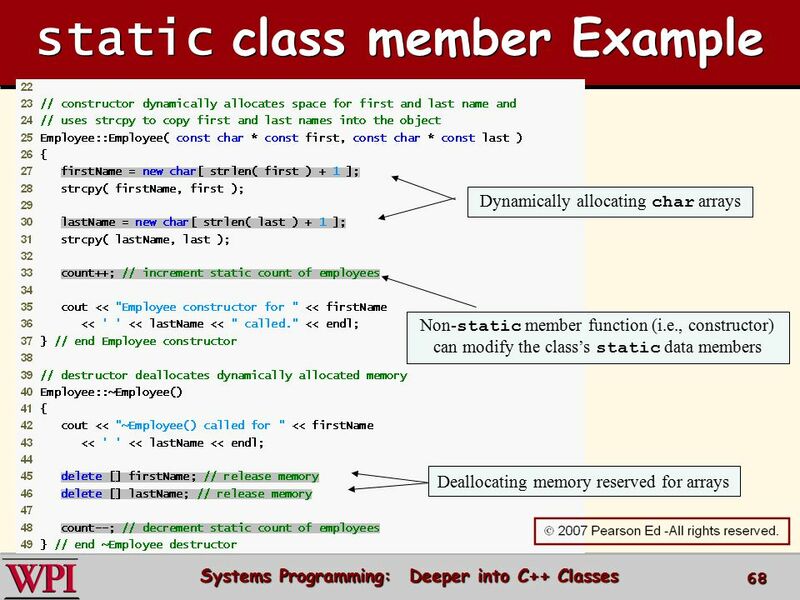 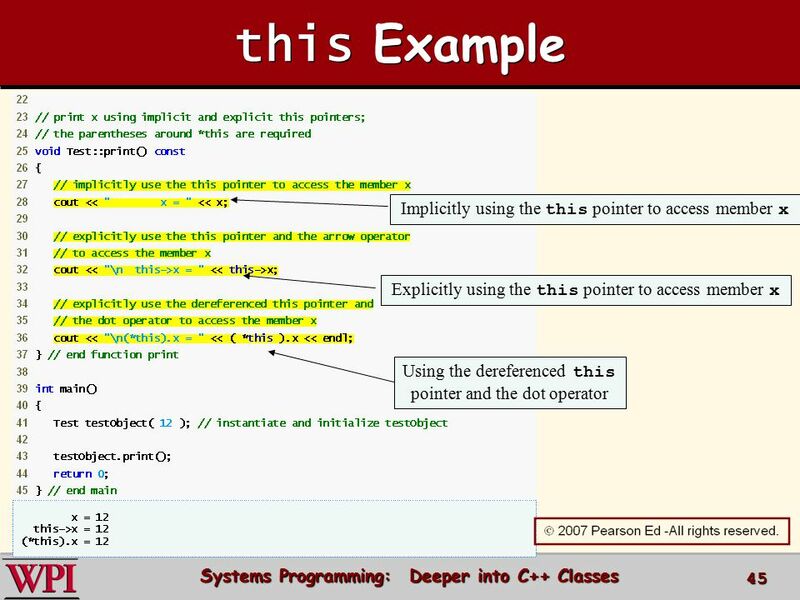 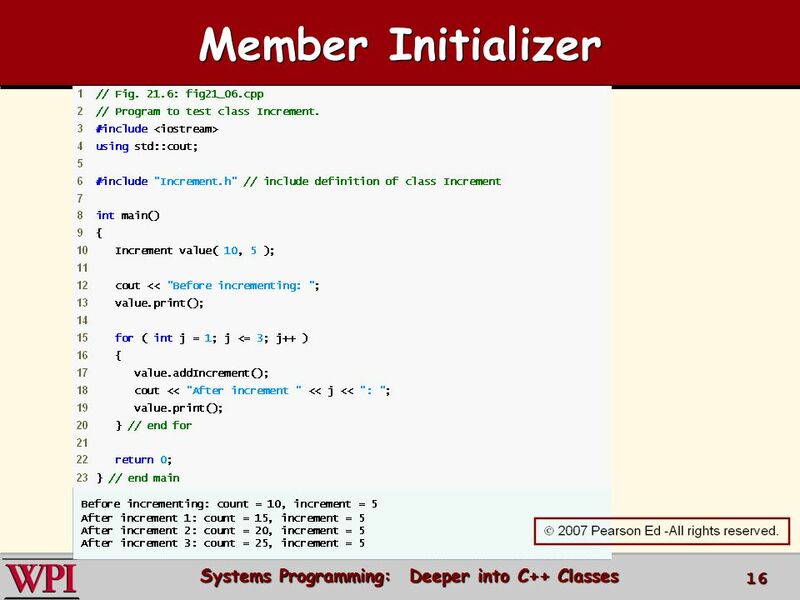 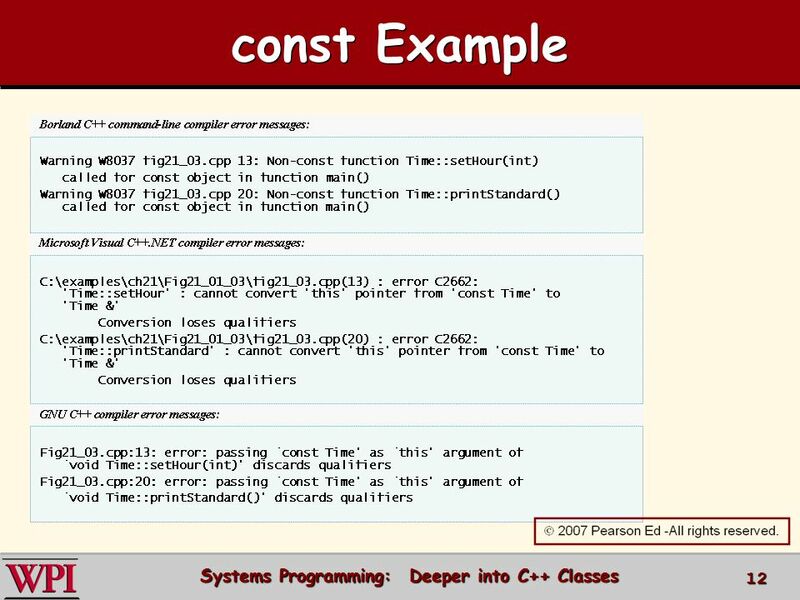 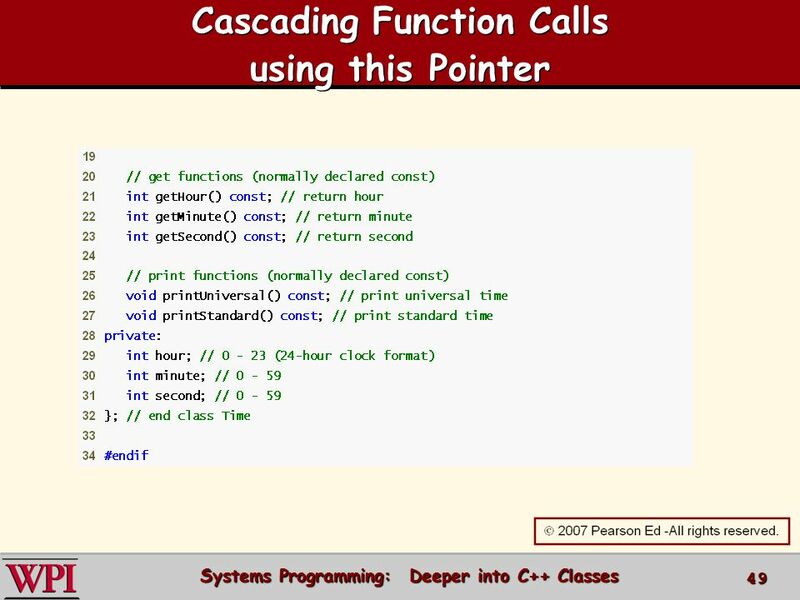 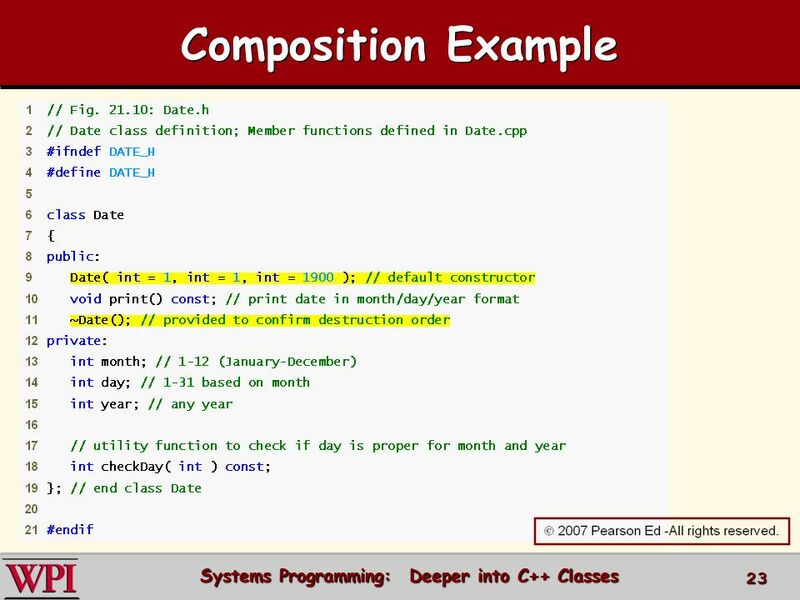 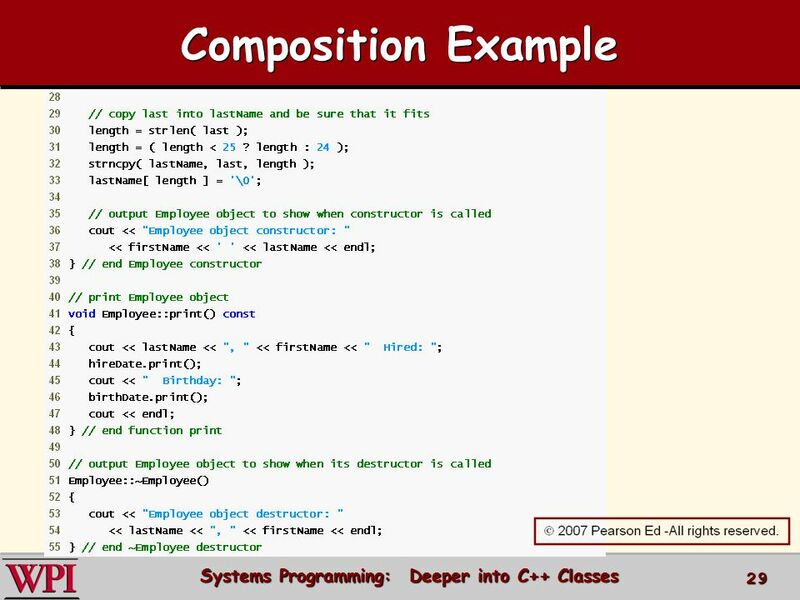 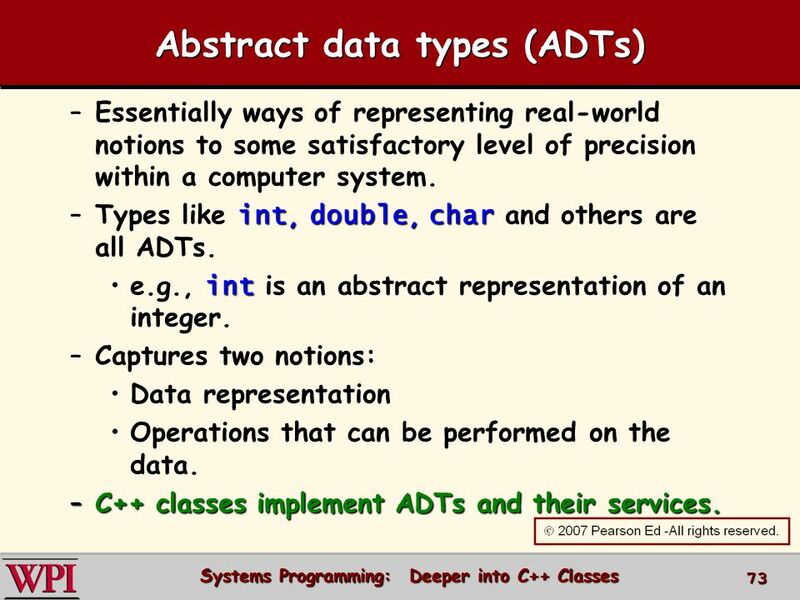 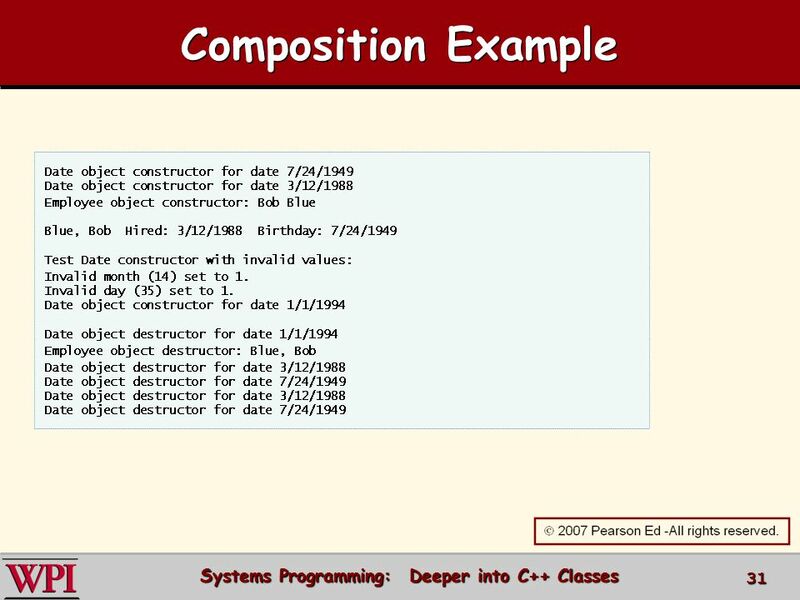 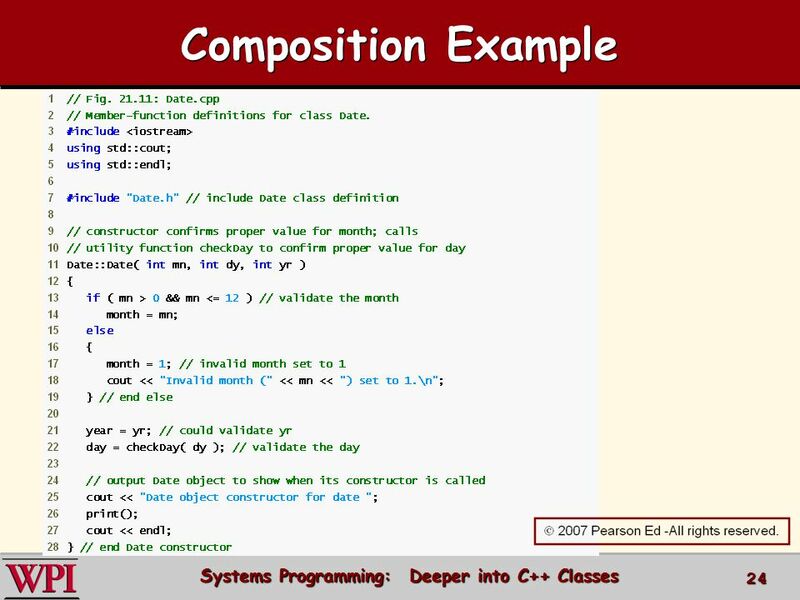 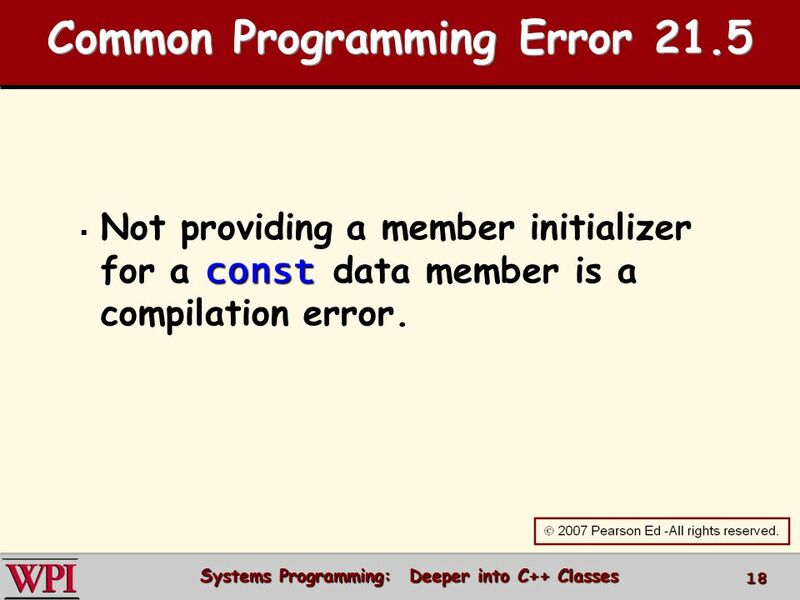 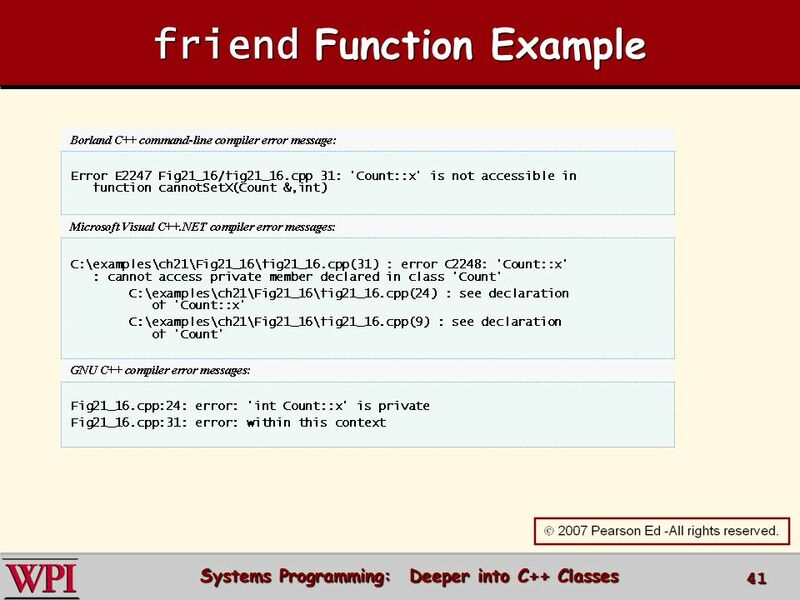 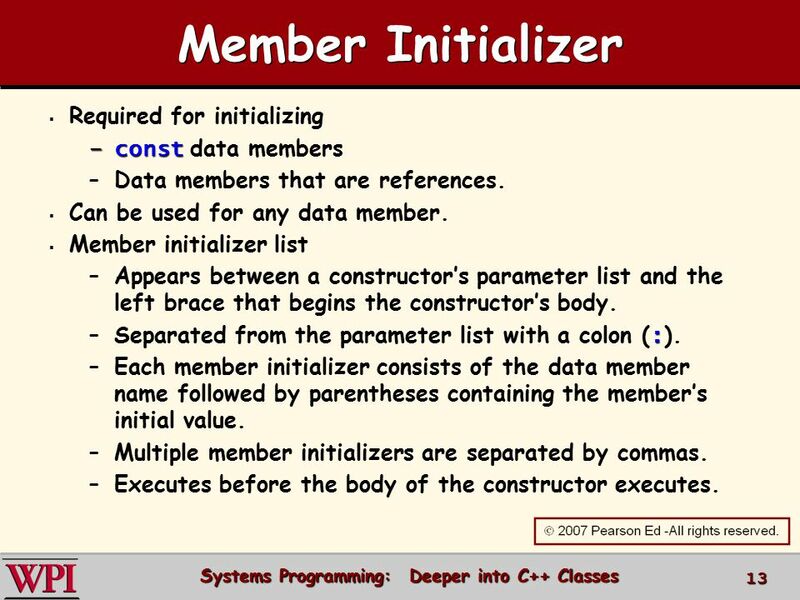 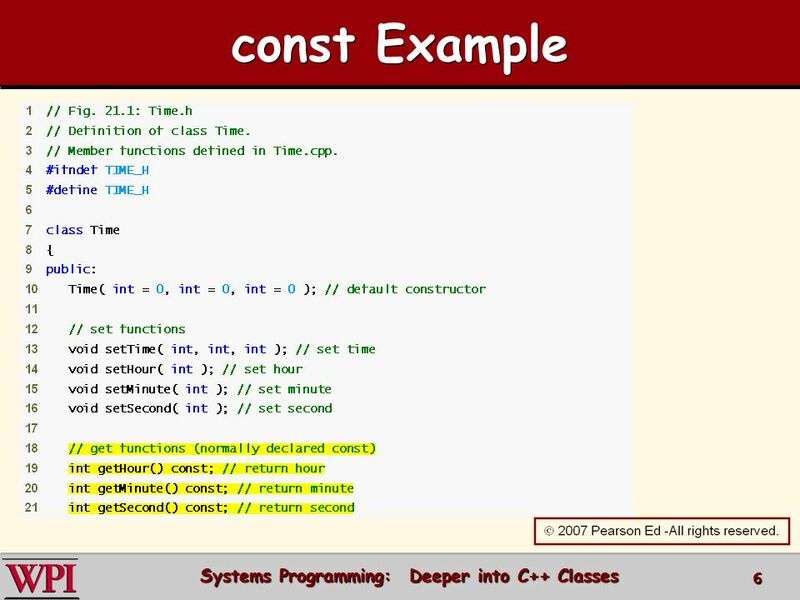 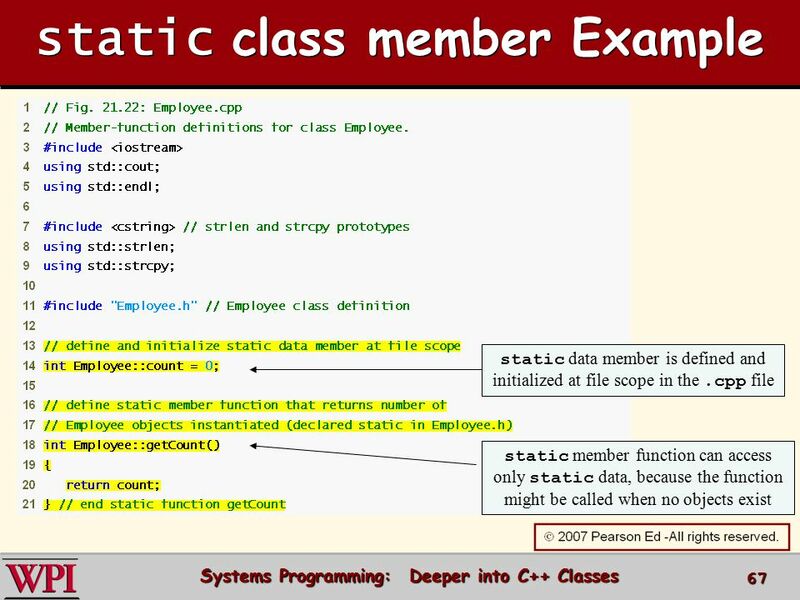 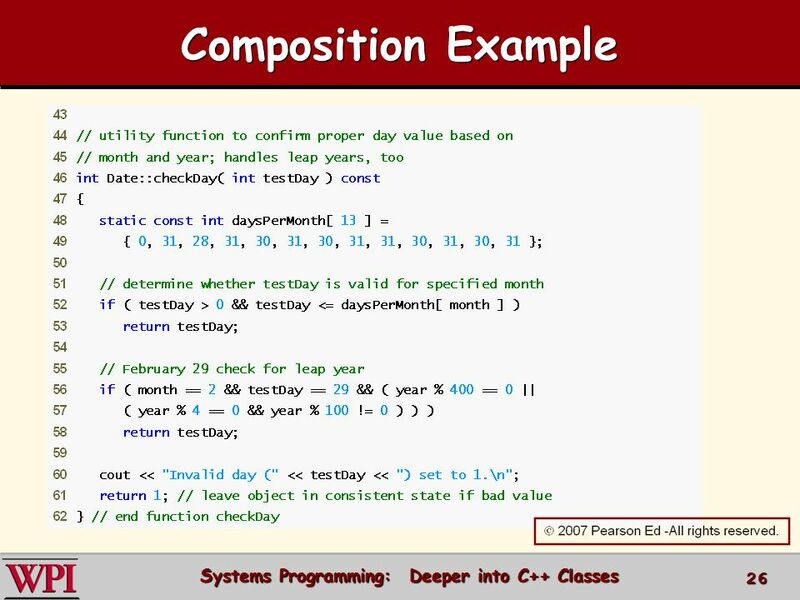 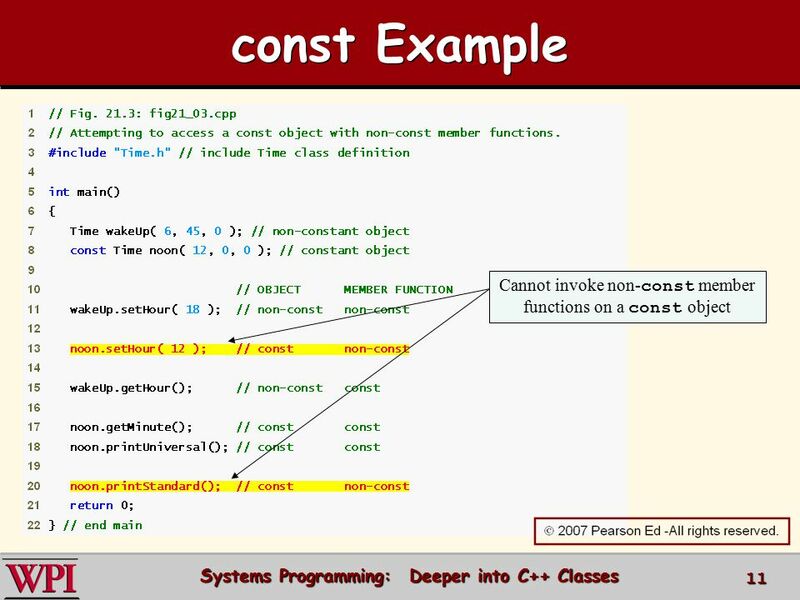 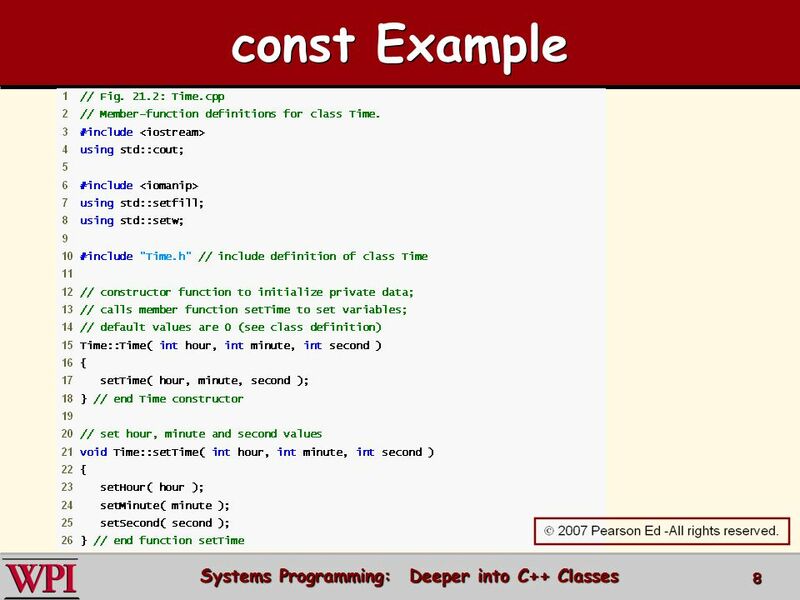 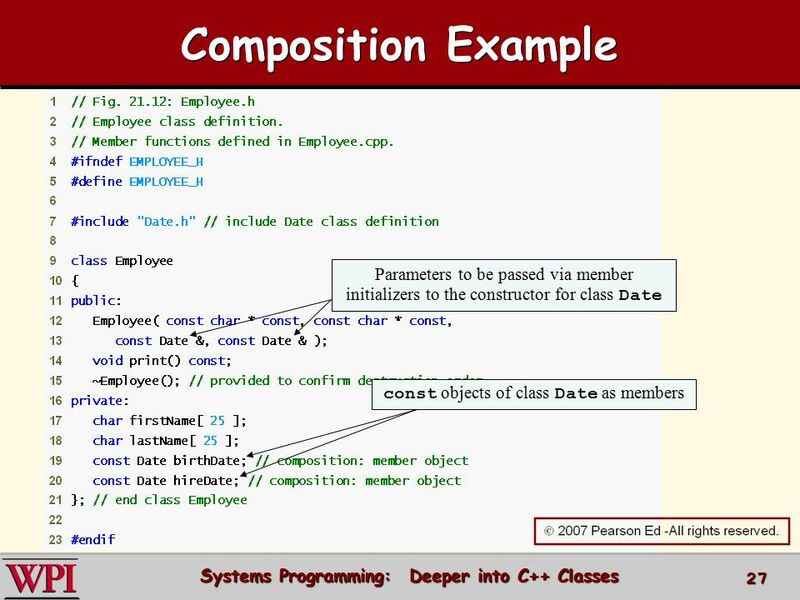 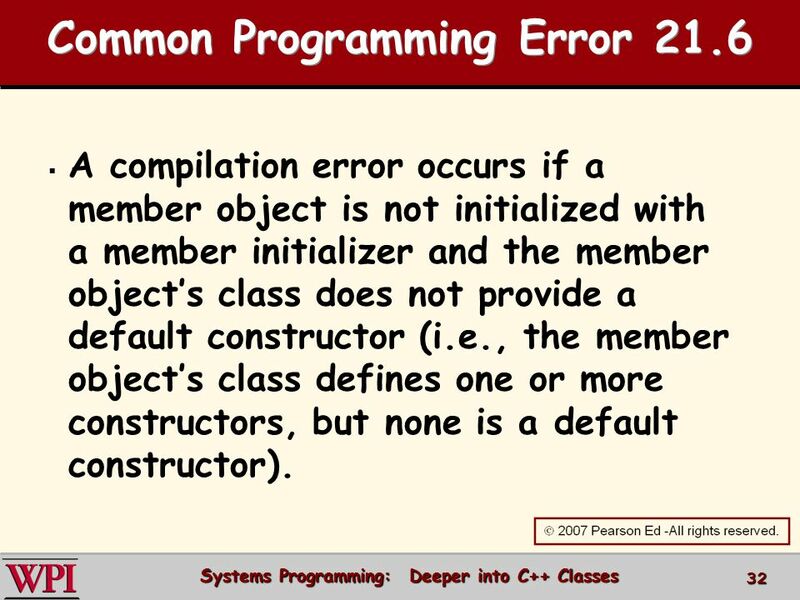 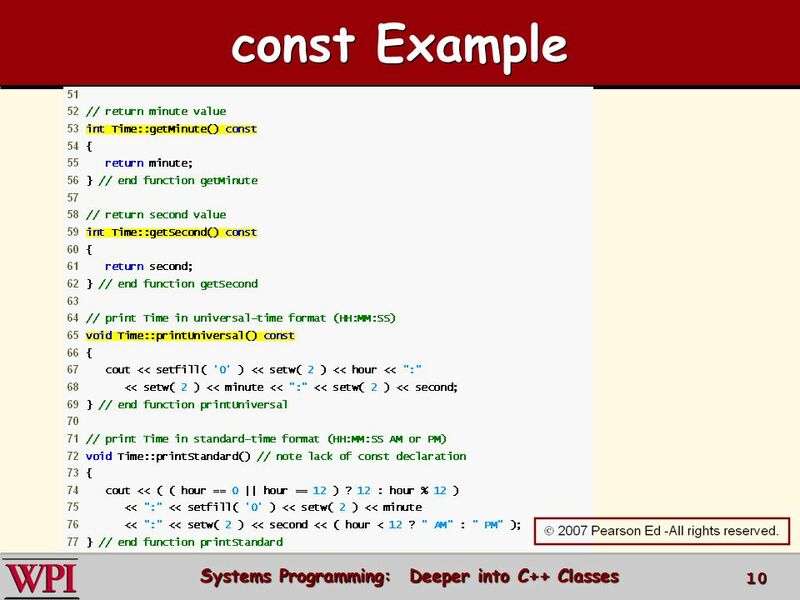 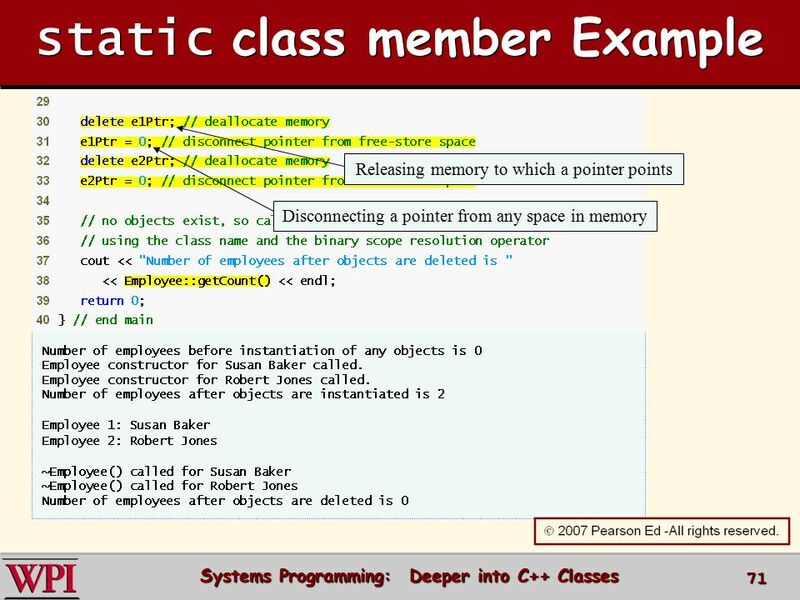 A Deeper Look at Classes CS-2303, C-Term A Deeper Look at Classes CS-2303 System Programming Concepts (Slides include materials from The C Programming. 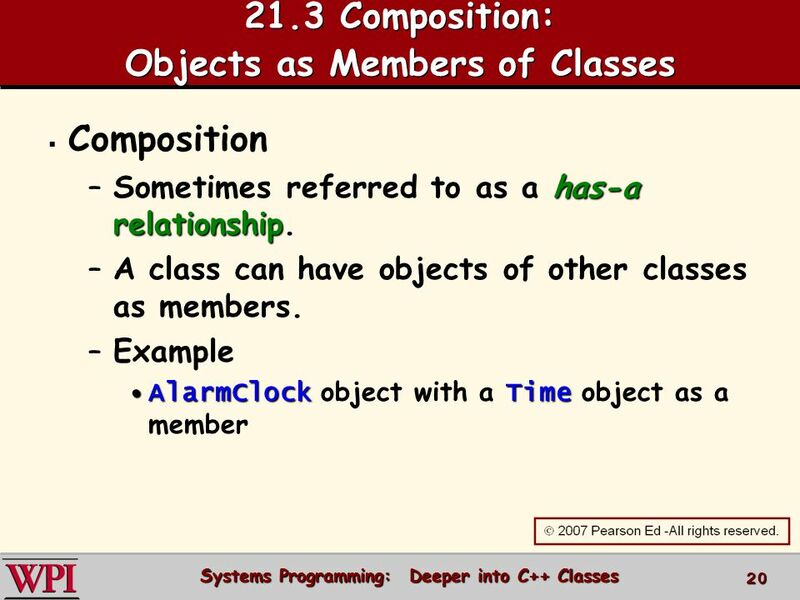  2006 Pearson Education, Inc. All rights reserved Classes: A Deeper Look, Part 2. 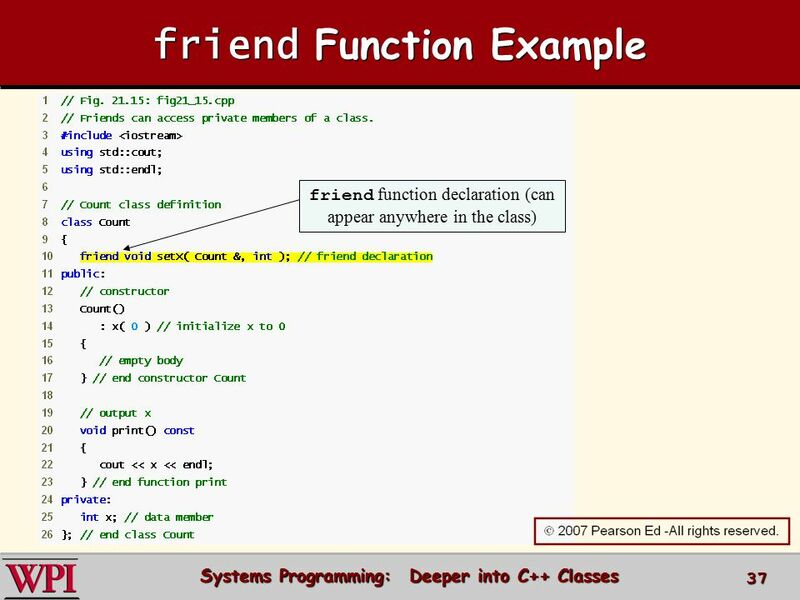 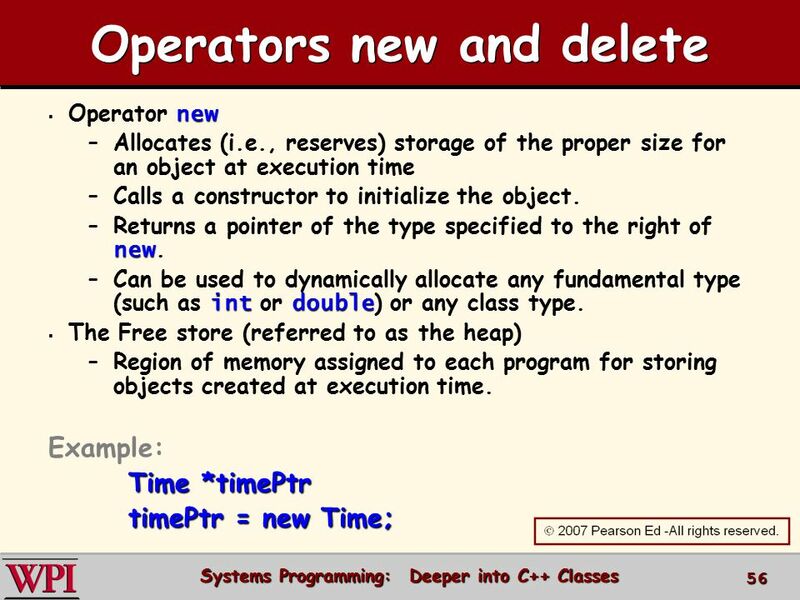 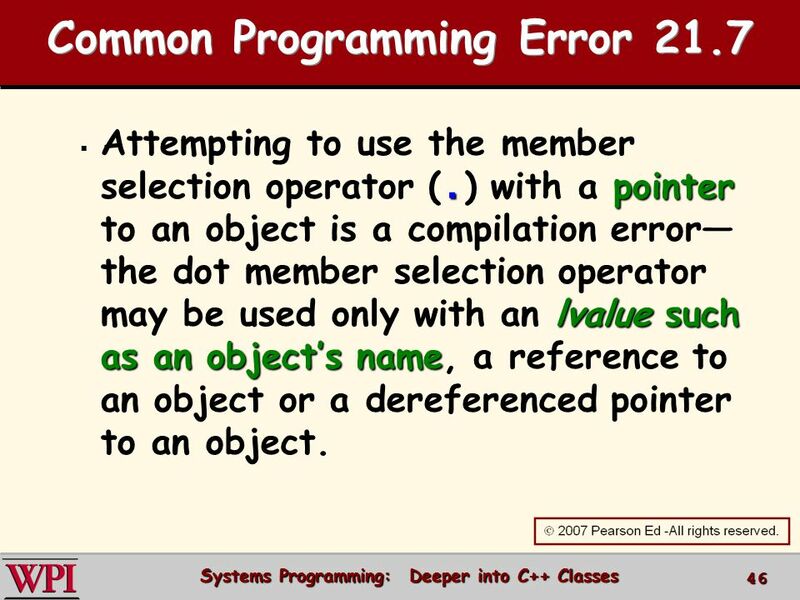 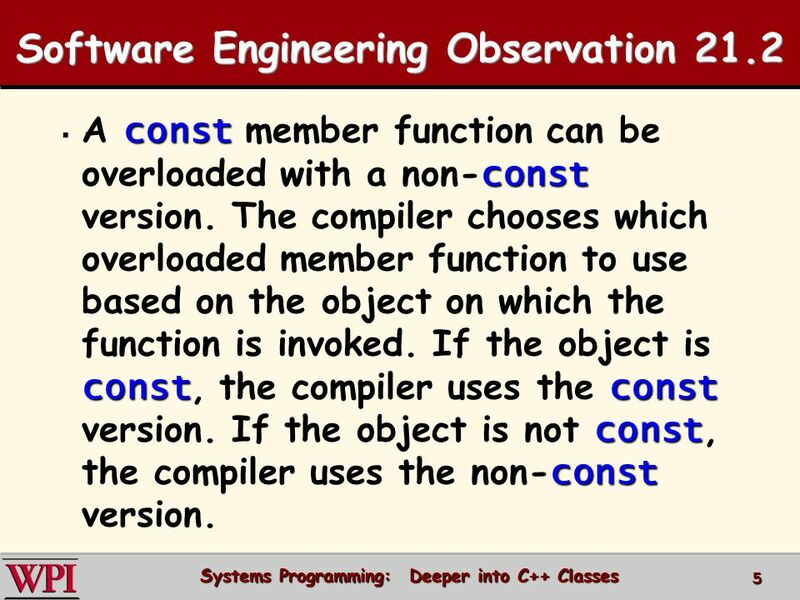 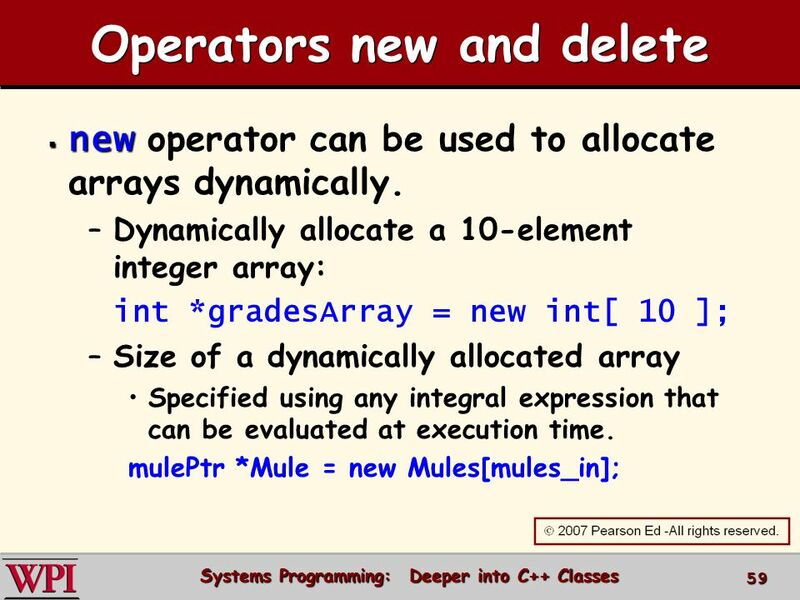 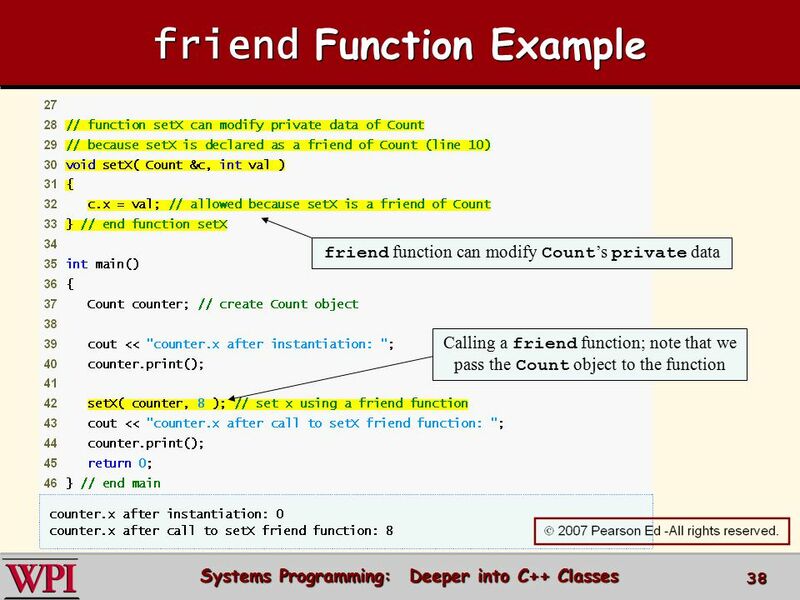 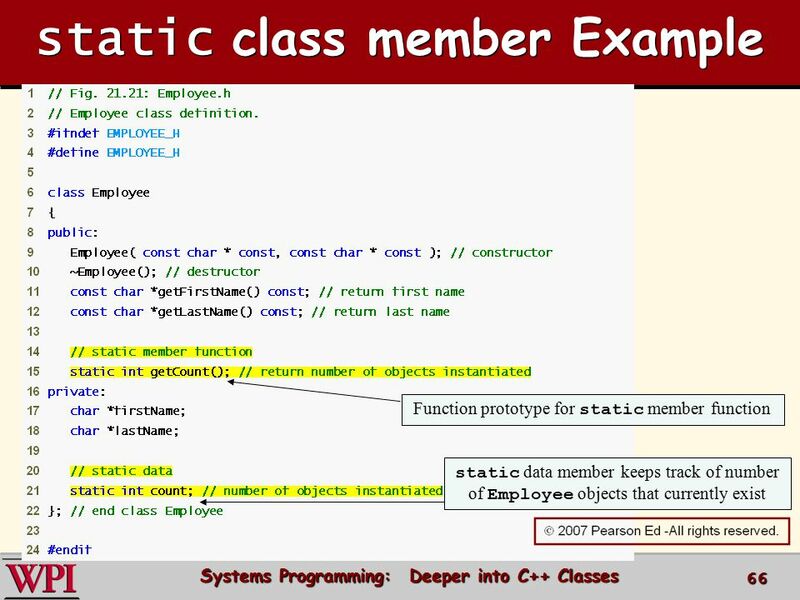 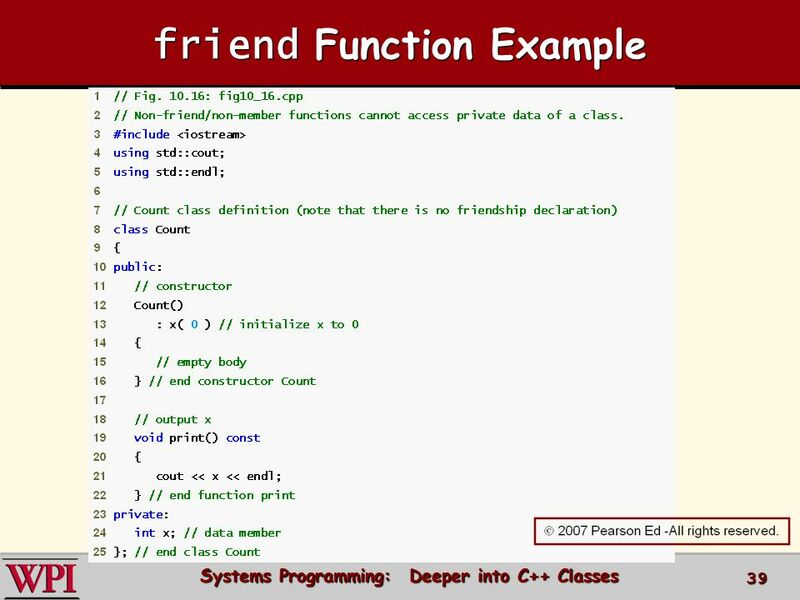 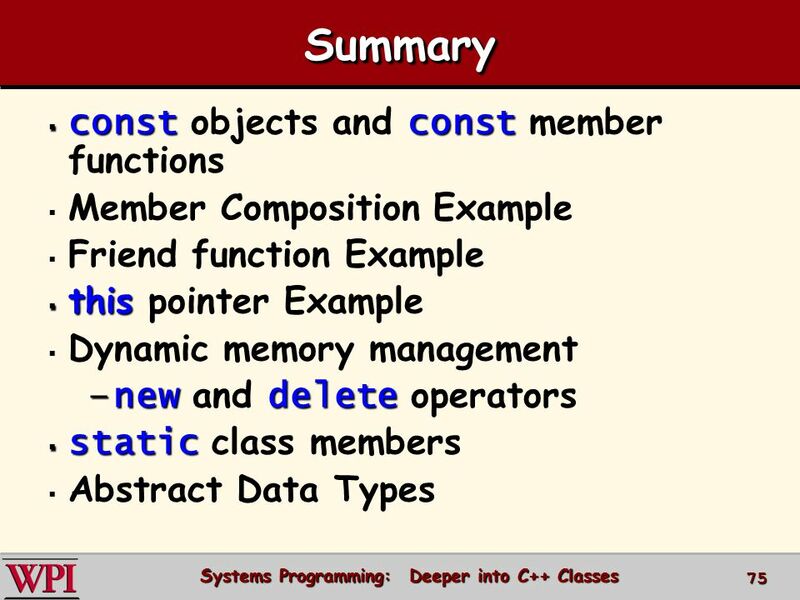 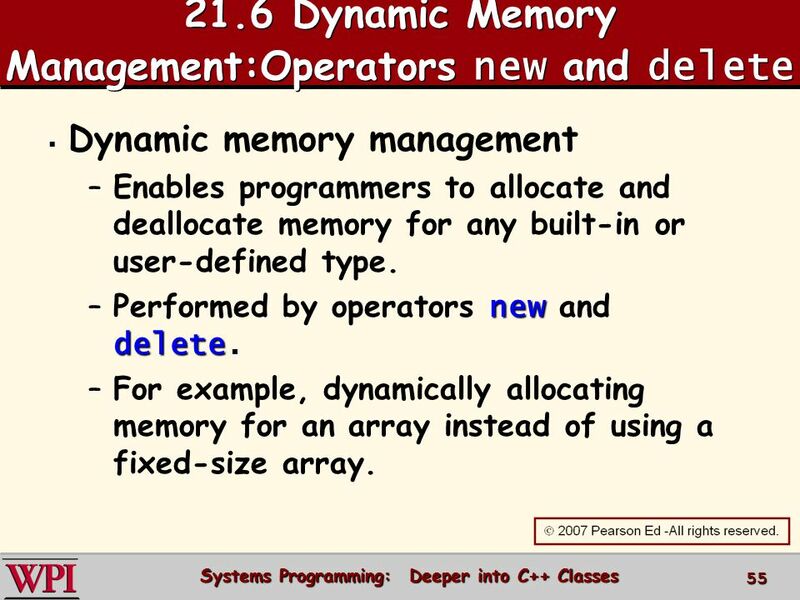 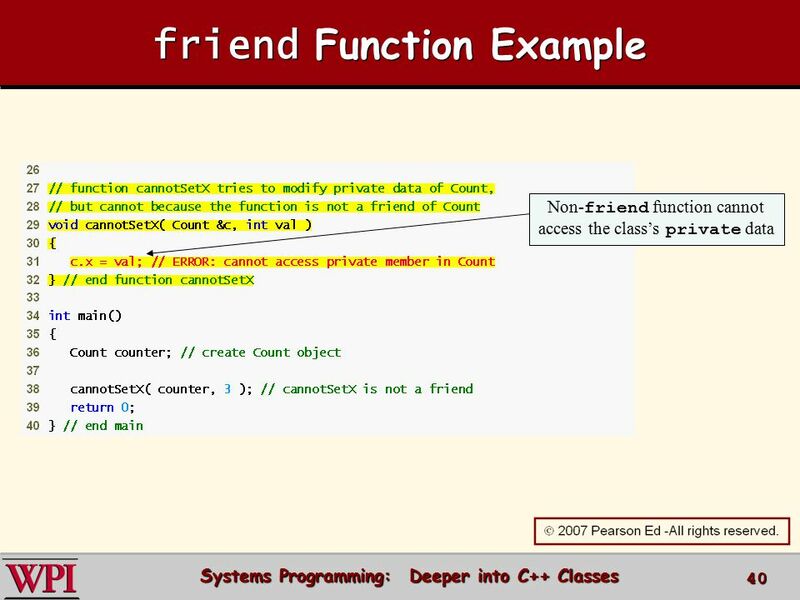 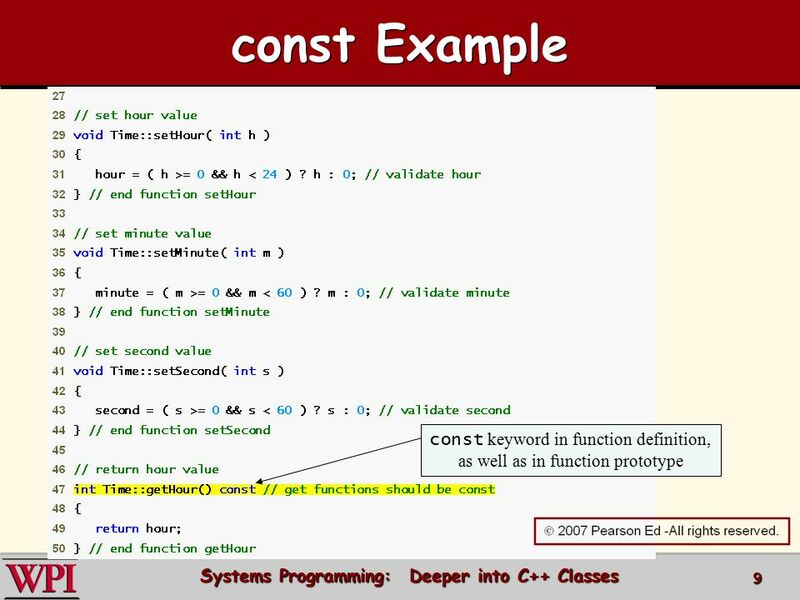 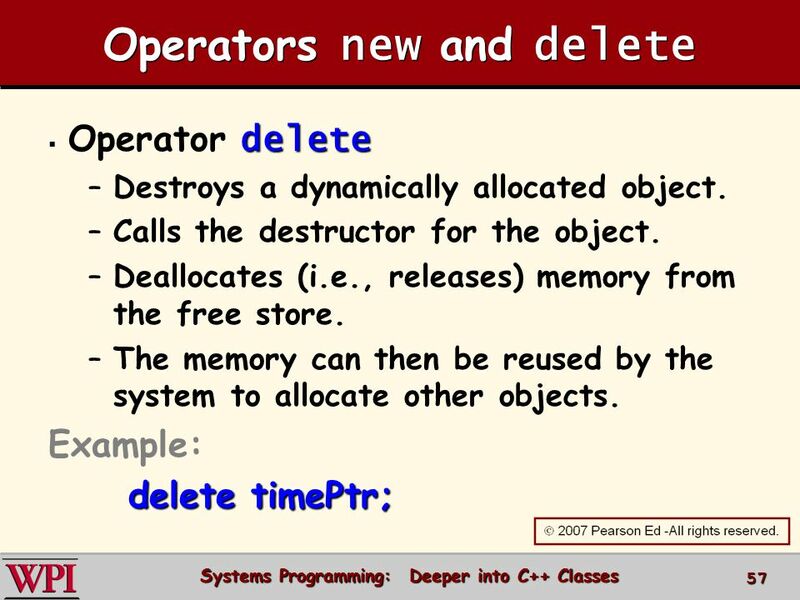 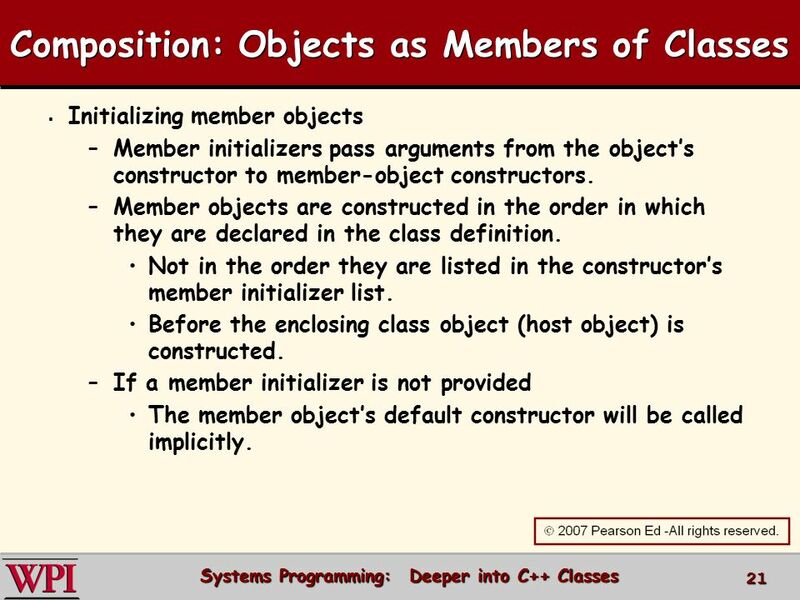 1 CSC241: Object Oriented Programming Lecture No 07.
Review of C++ Programming Part II Sheng-Fang Huang. 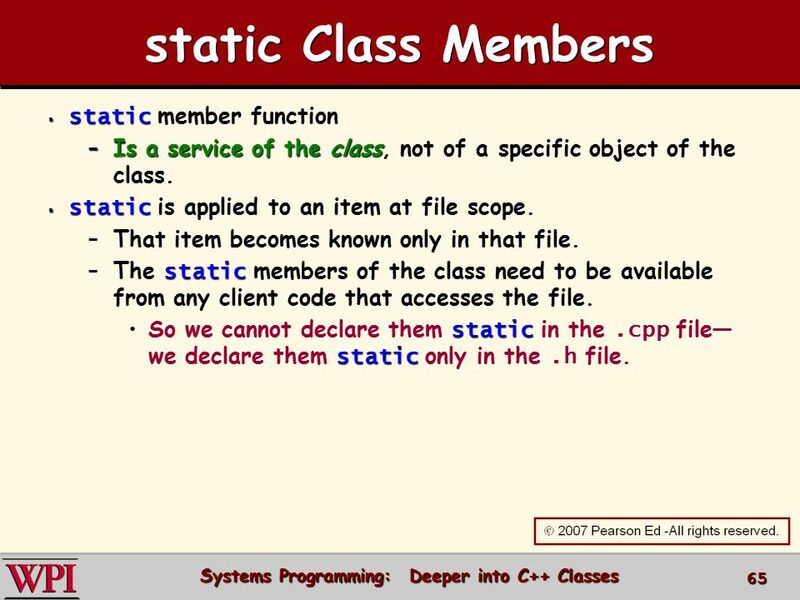 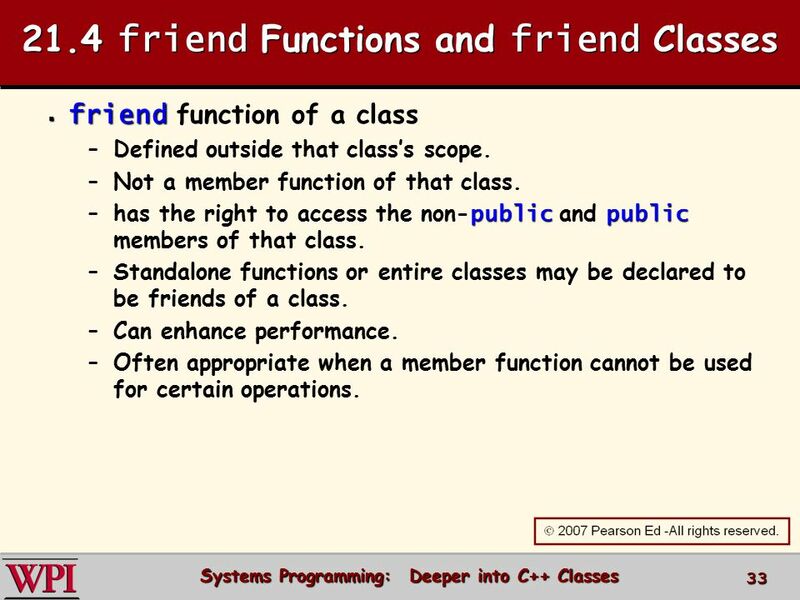 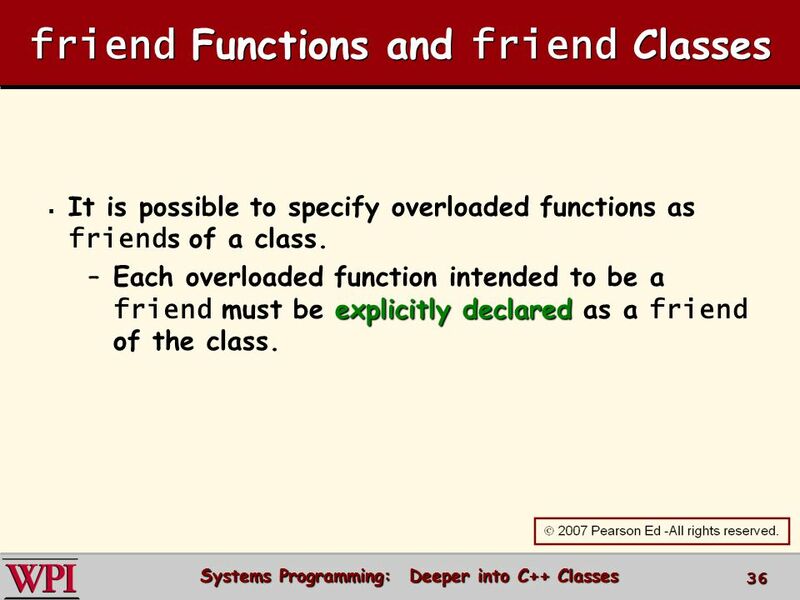 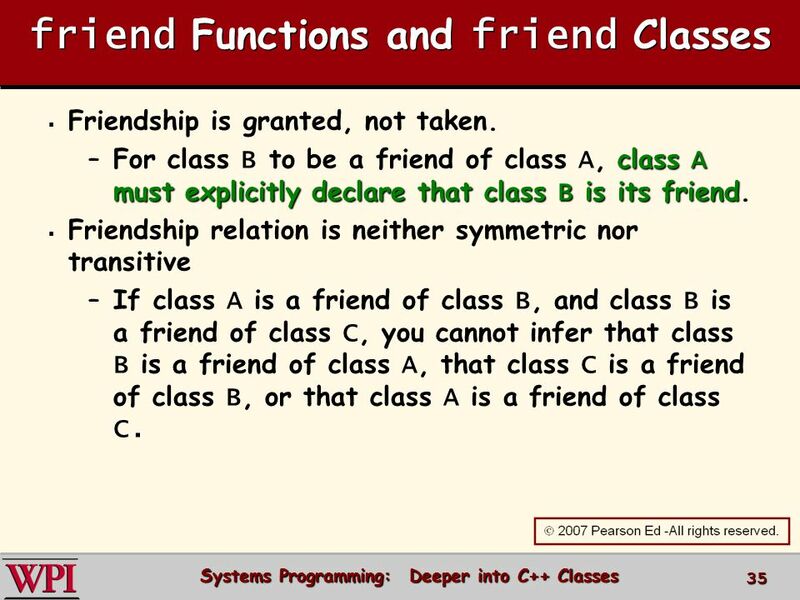 CS-1030 Dr. Mark L. Hornick 1 Basic C++ State the difference between a function/class declaration and a function/class definition. 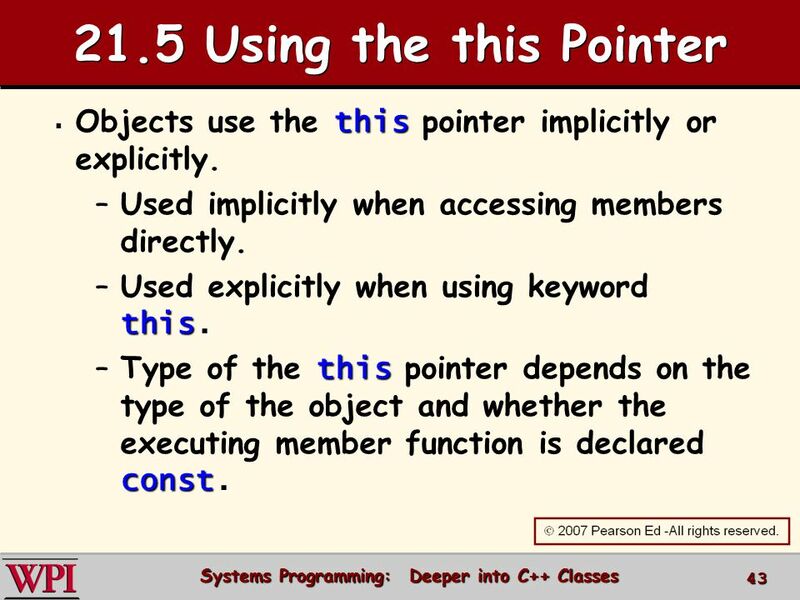 Explain the purpose.